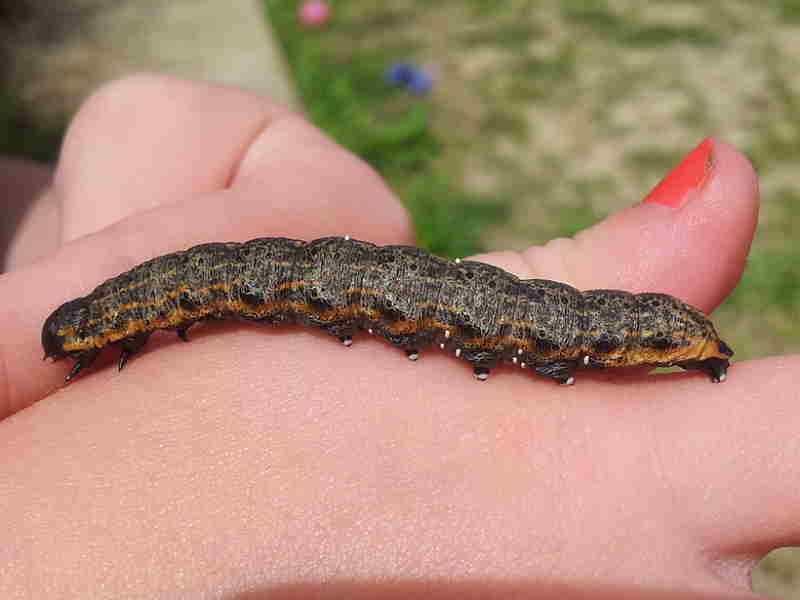 This is the largest family of macro moth caterpillars in the British Isles with over 400 species. 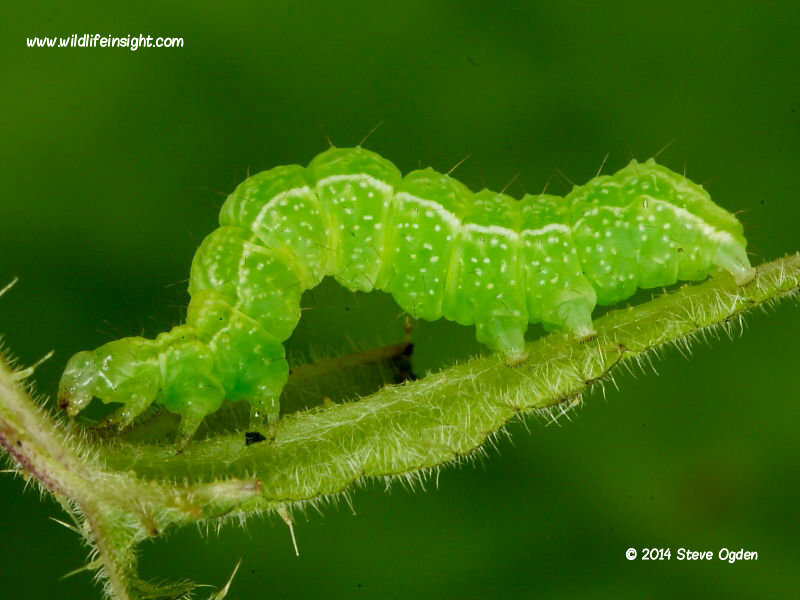 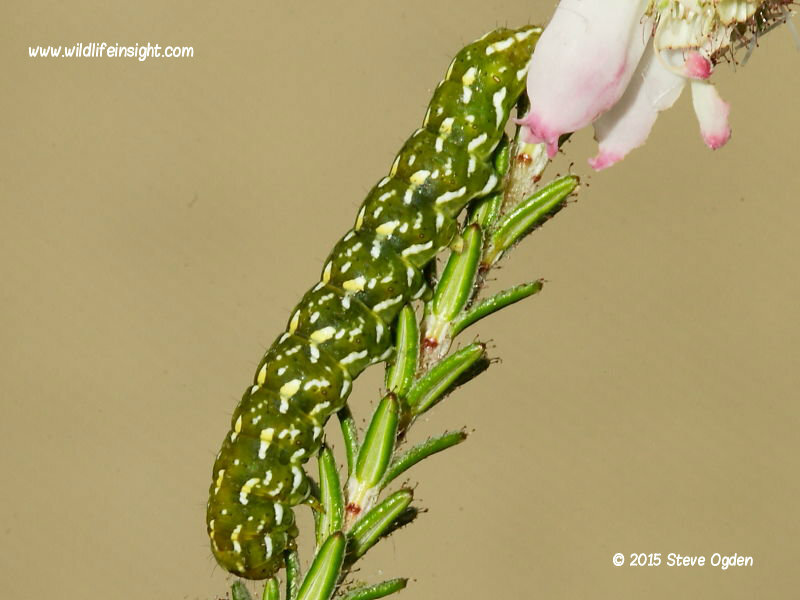 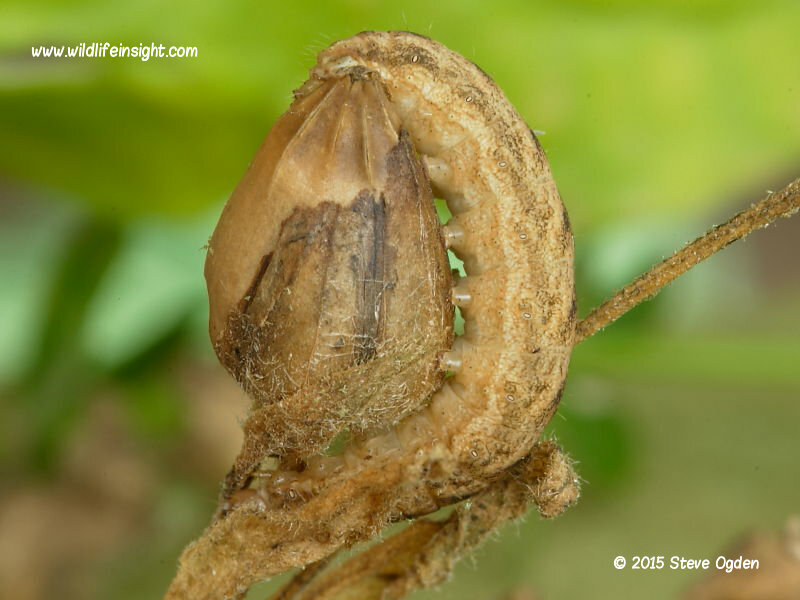 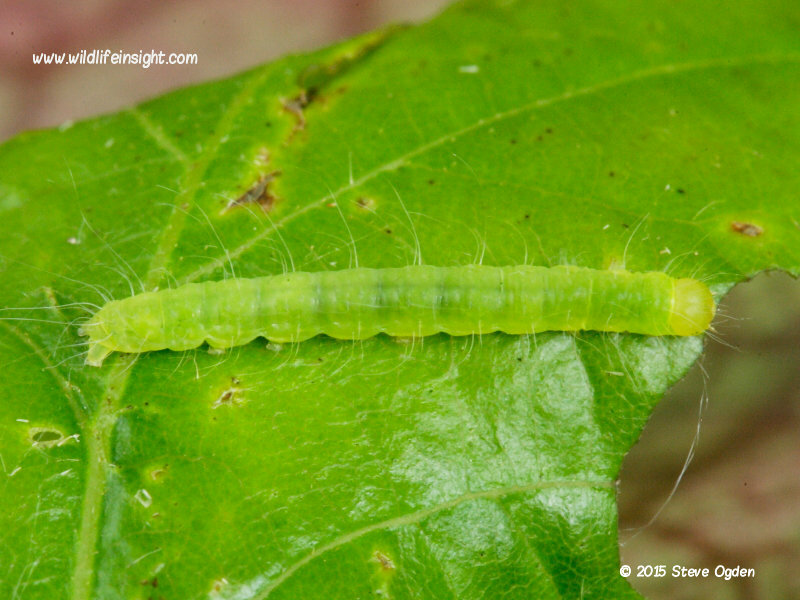 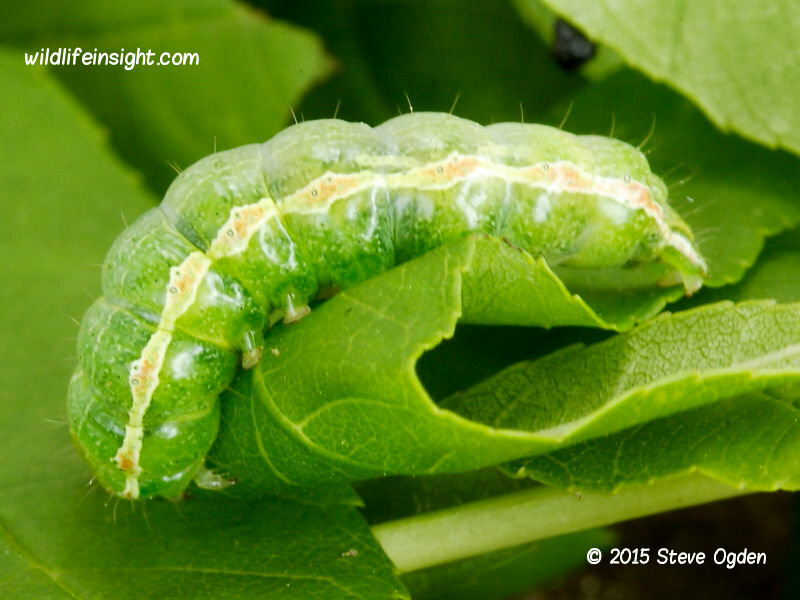 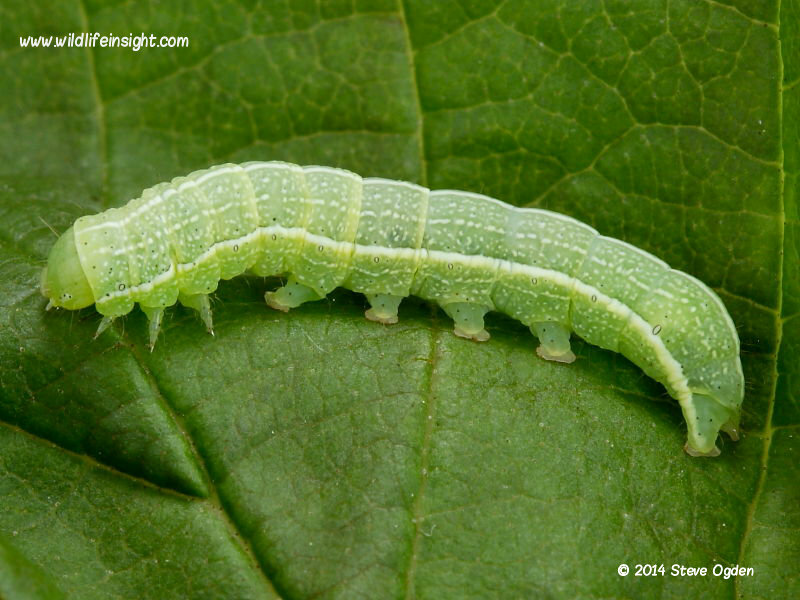 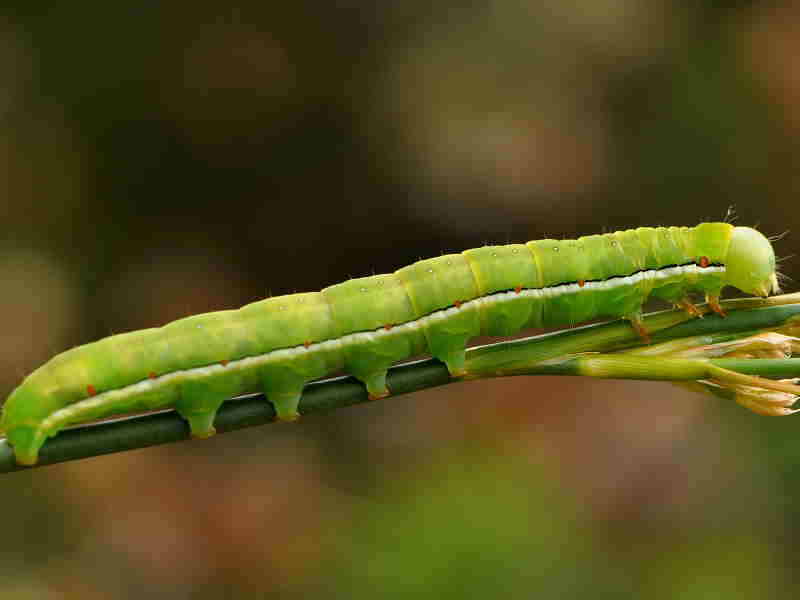 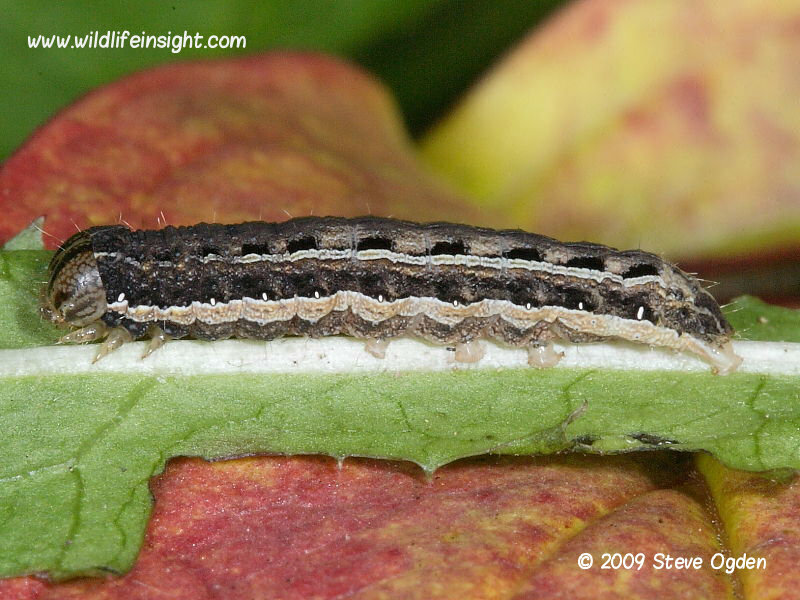 Included are some of the most commonly sighted caterpillars such as the Angle Shades. 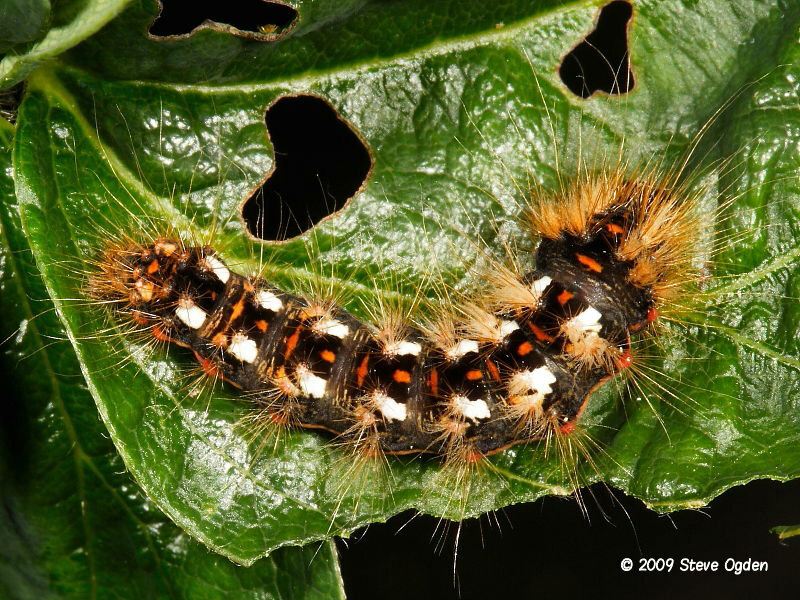 Due to the recent reclassification of some moth species several appearing here will be moved into the Erebidae family. 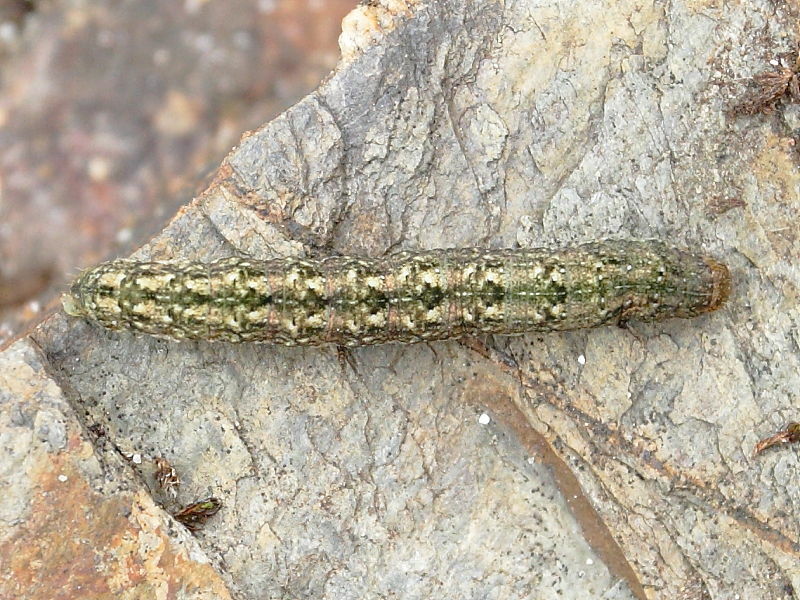 Most species have three true legs, four prolegs and a rear clasper. 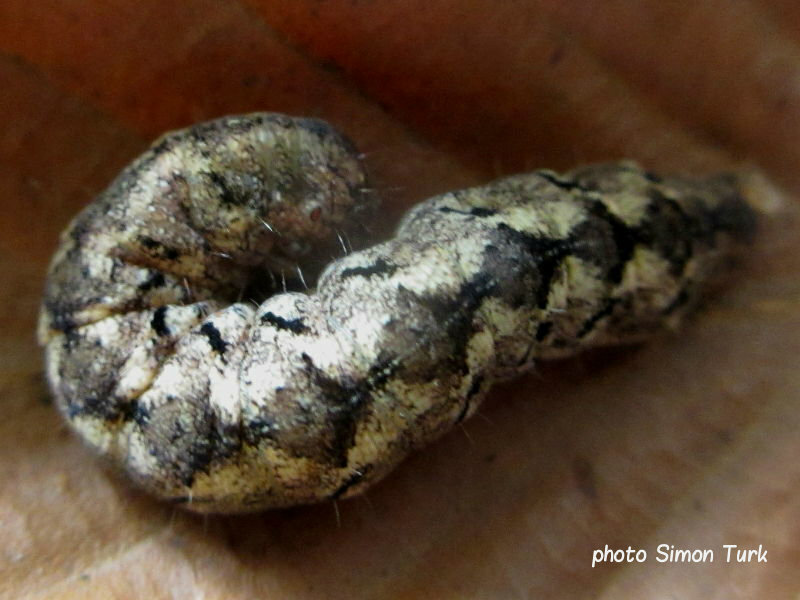 However, The Snouts have one less proleg and moths of the Plusiinae family such as Silver Y have 2 fewer prolegs. 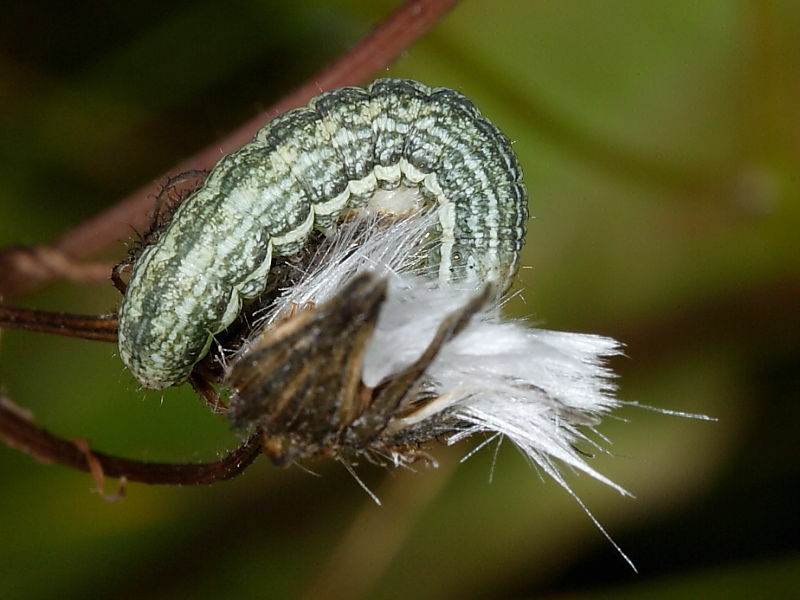 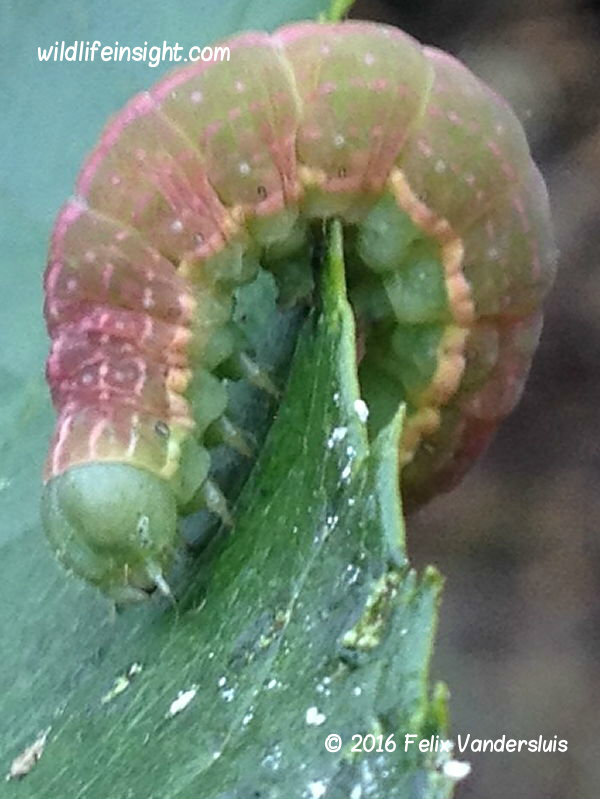 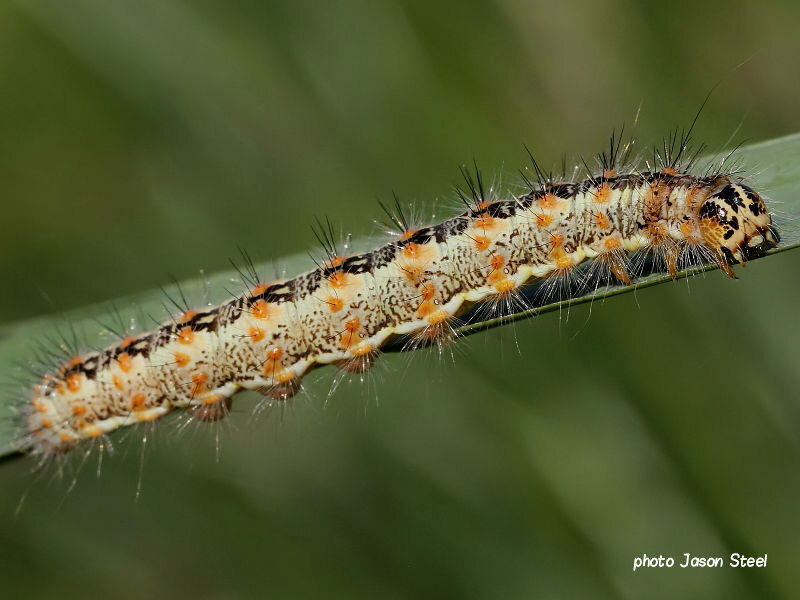 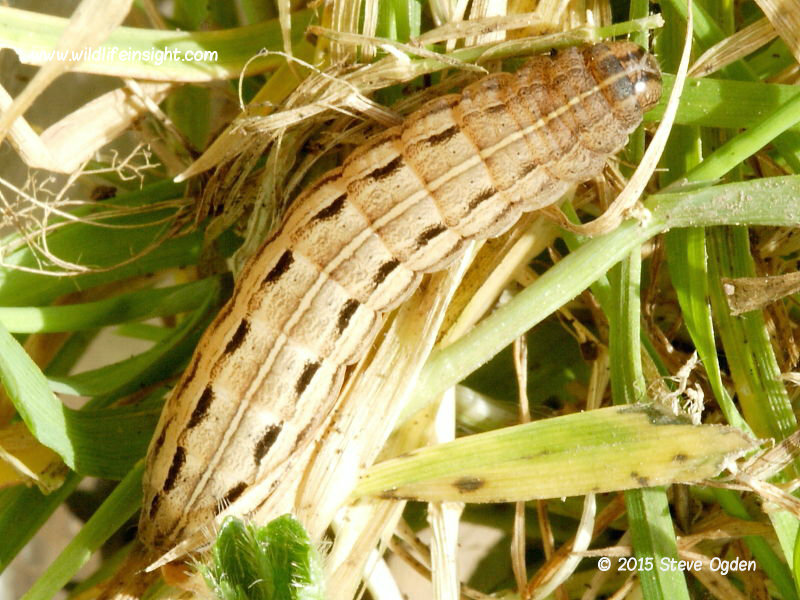 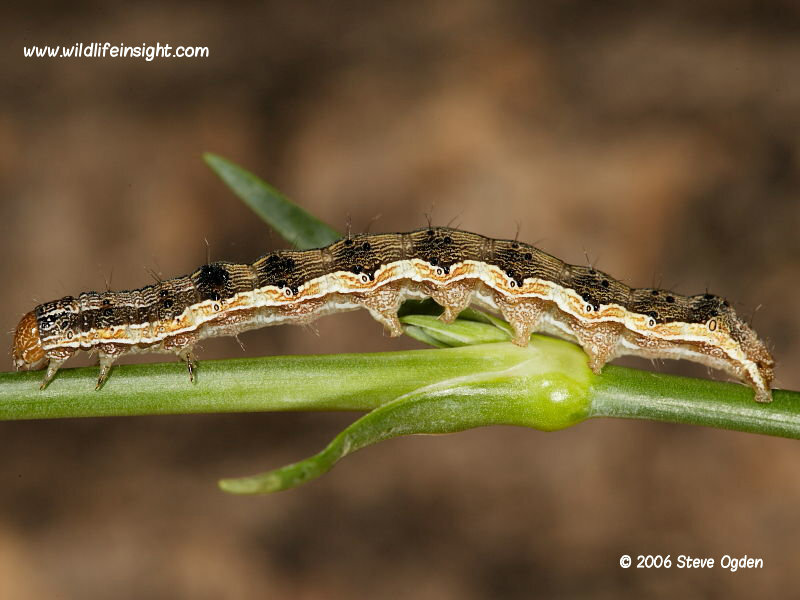 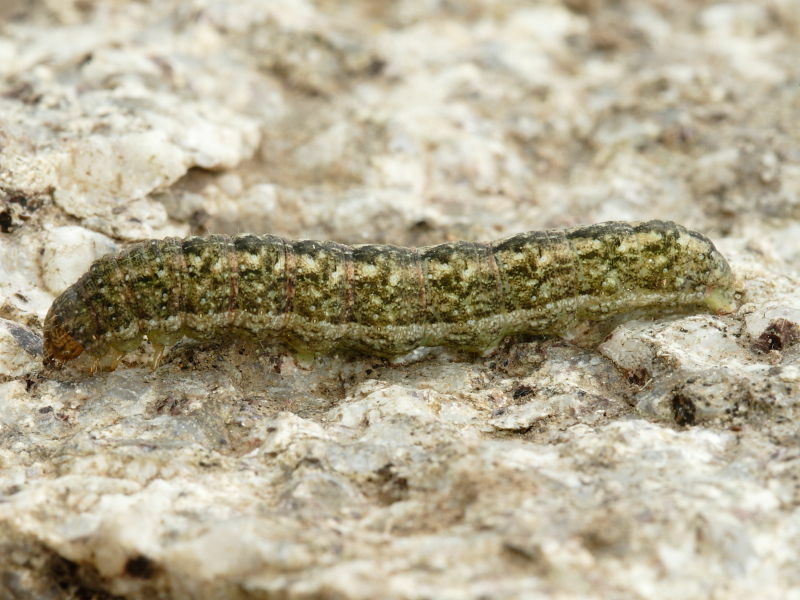 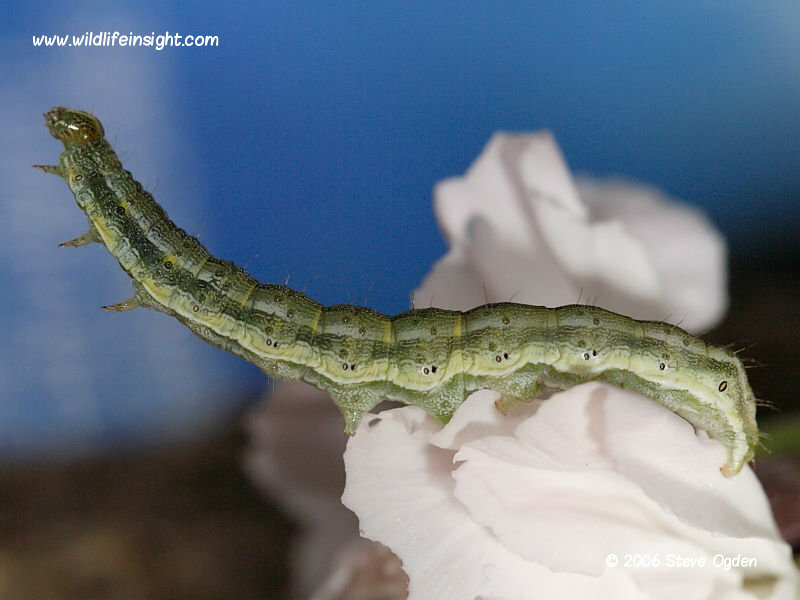 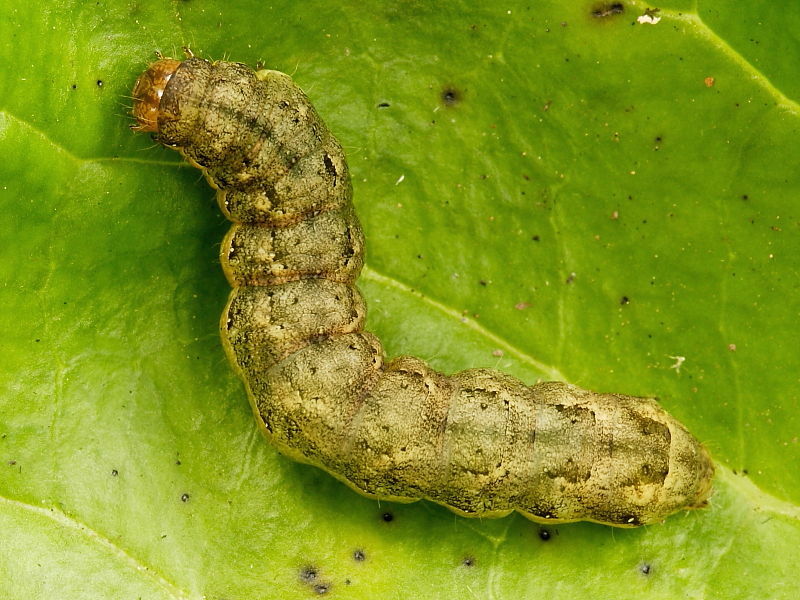 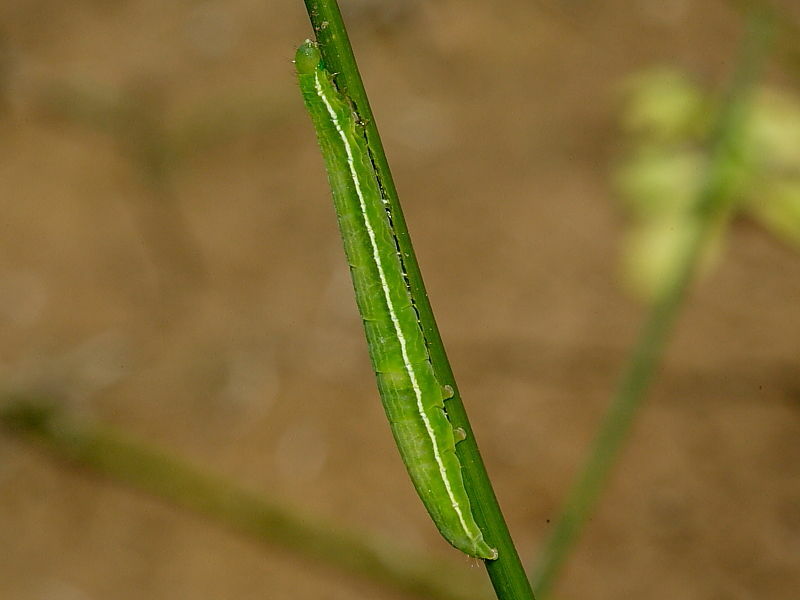 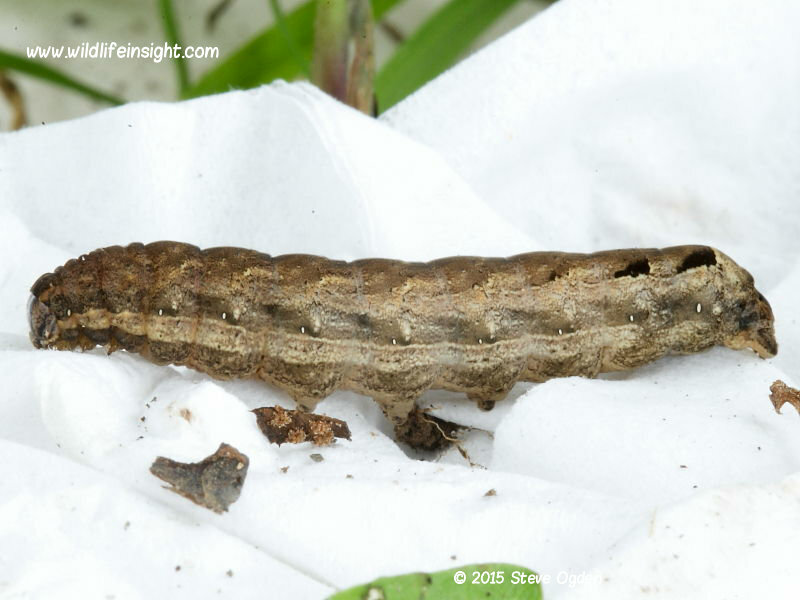 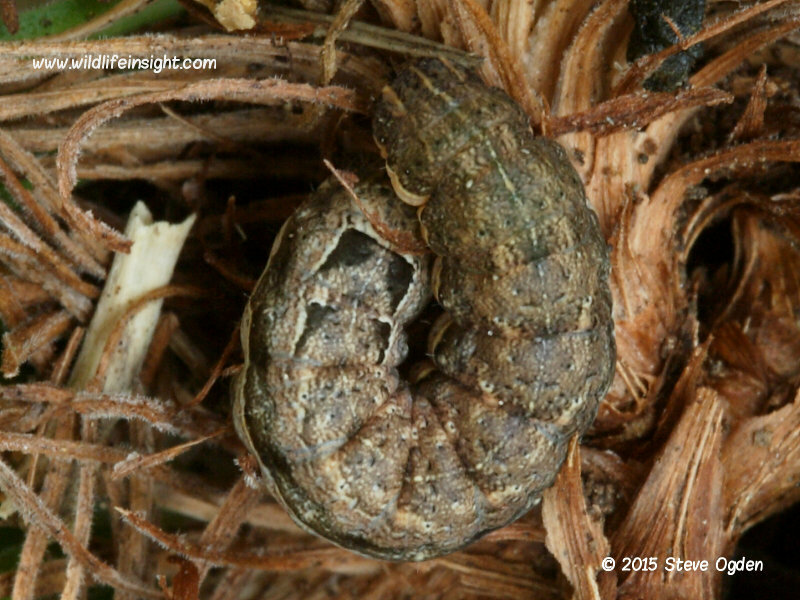 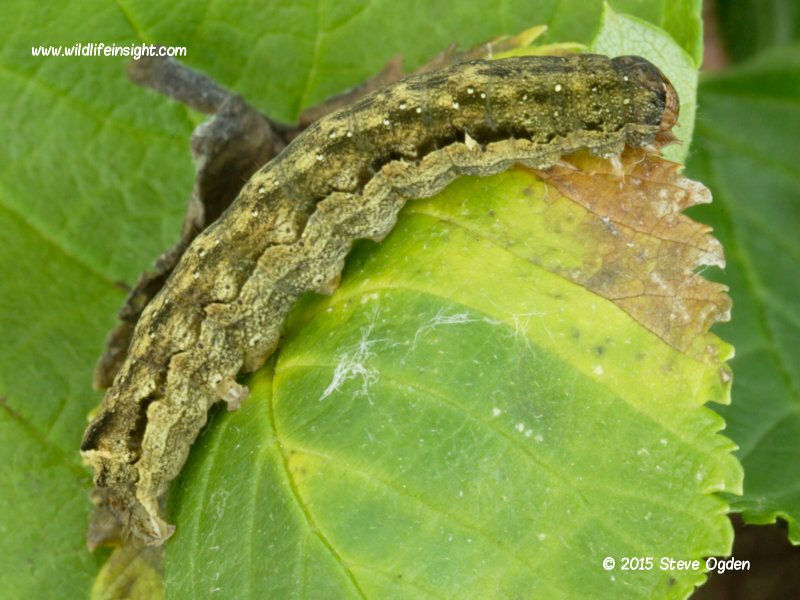 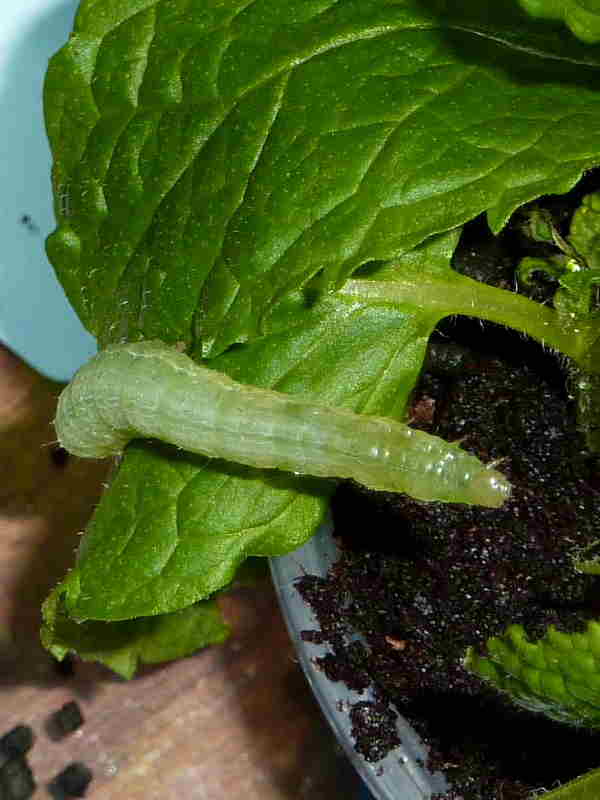 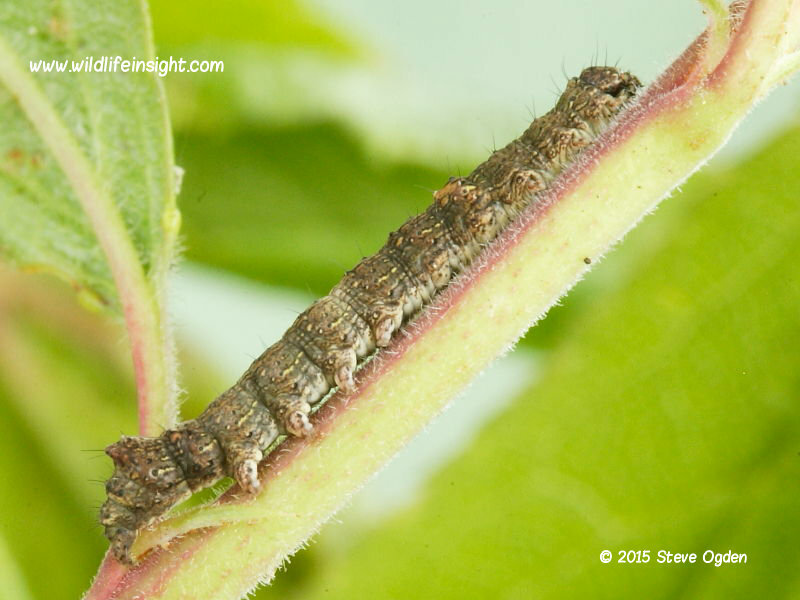 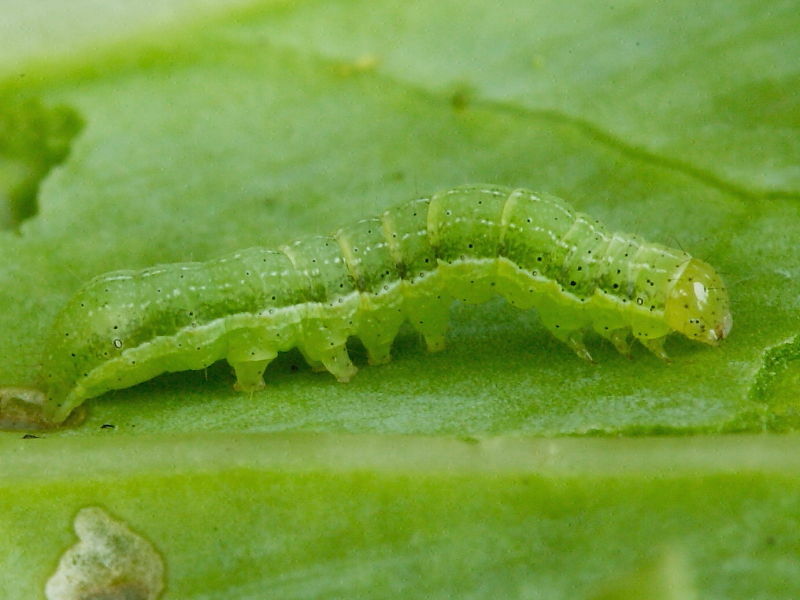 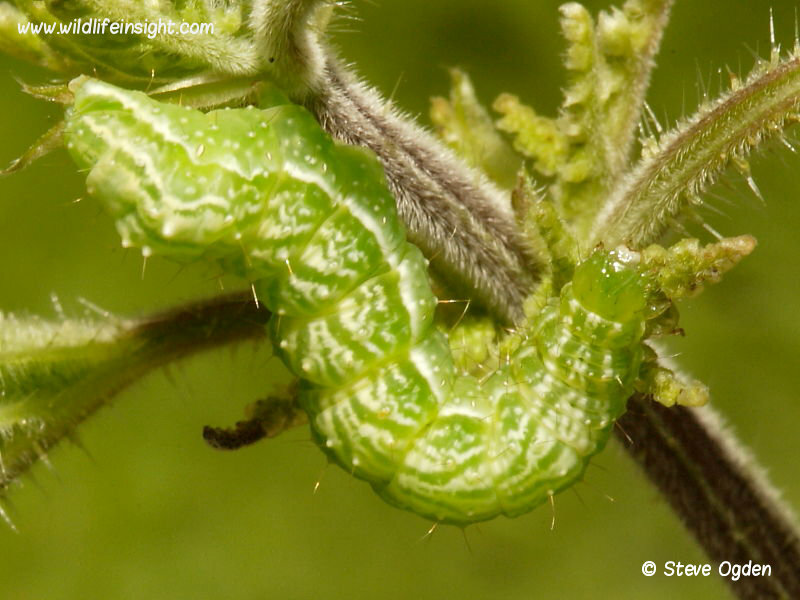 Many of these caterpillars such as the Large Yellow Underwing have relatively smooth skins with few obvious hairs and live hidden in the soil or low down at the base of plants. 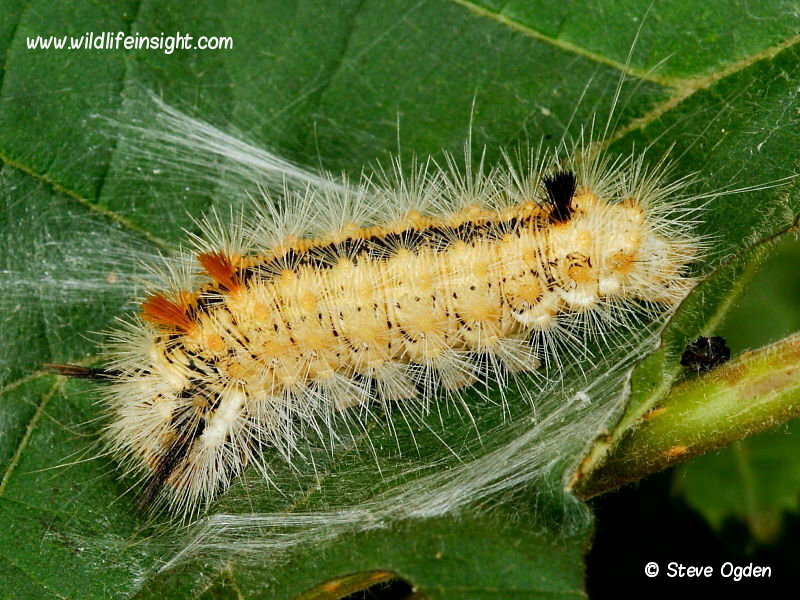 While others are extraordinarily hairy such as the Miller and Sycamore Moth which feed on the leaves of deciduous trees. 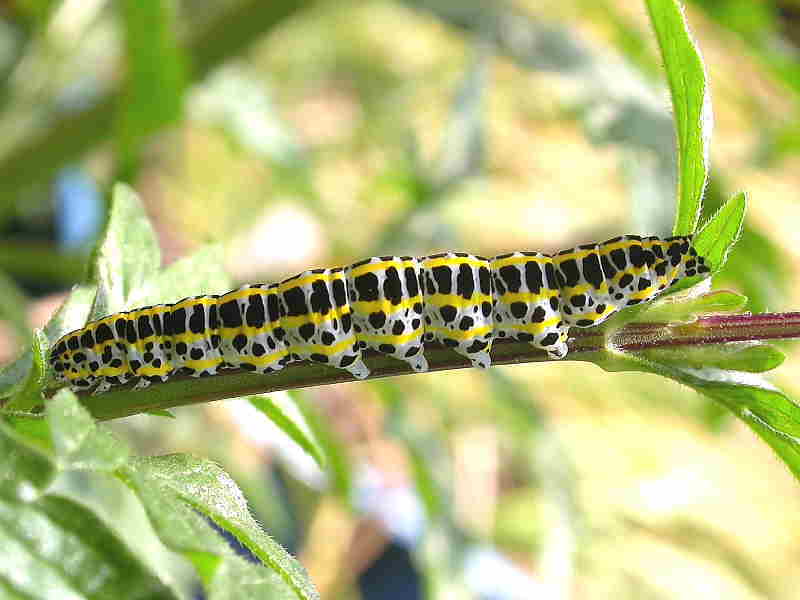 Others such as The Knot Grass, the brightly coloured Mullein Moth caterpillars and Dark and Grey species of Dagger are amongst the top twenty most enquired about caterpillars. 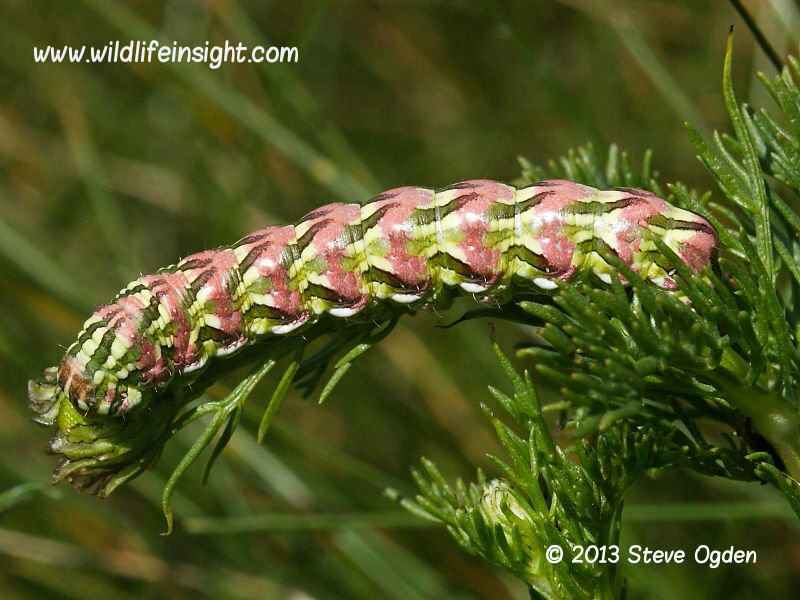 One of the most extraordinarily caterpillars is that of the Chamomile Shark which despite its large size and streaks of colour blends in making it surprisingly difficult to see amongst its food plant, species of Mayweed. 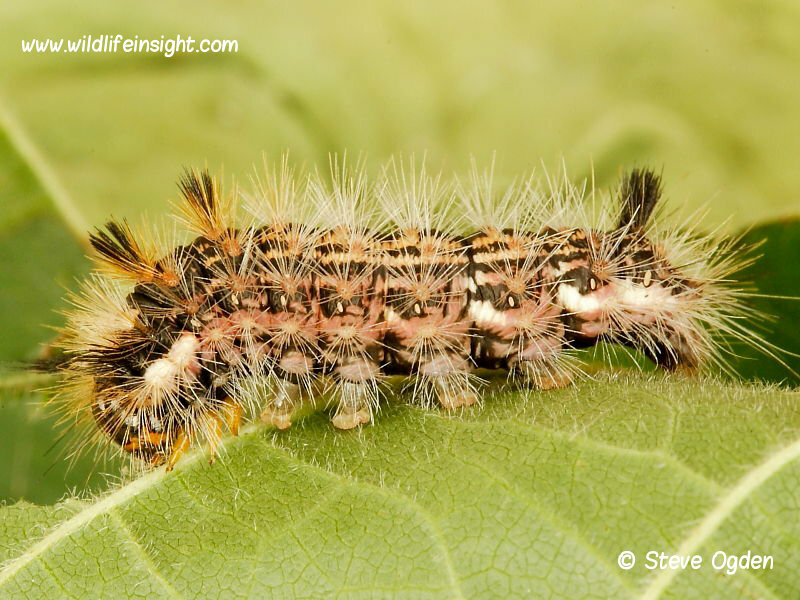 Nut–tree Tussock caterpillar is the only member of the sub family Pantheinae. 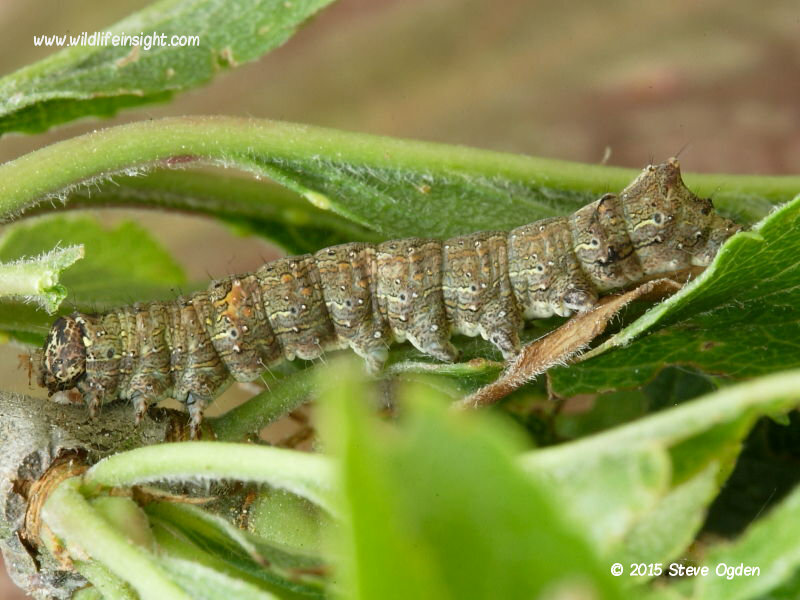 Also included are the caterpillars of the Scarce Bordered Straw and Bordered Straw regular migrants and two or the commonest caterpillars to be imported into the British Isles on cultivated flowers. 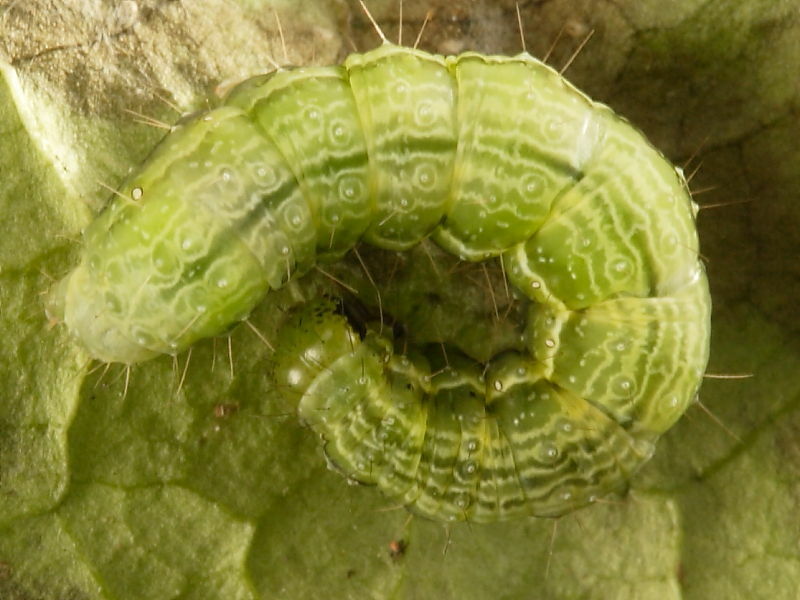 In the Cucullinae family are three moth species with strikingly marked caterpillars. 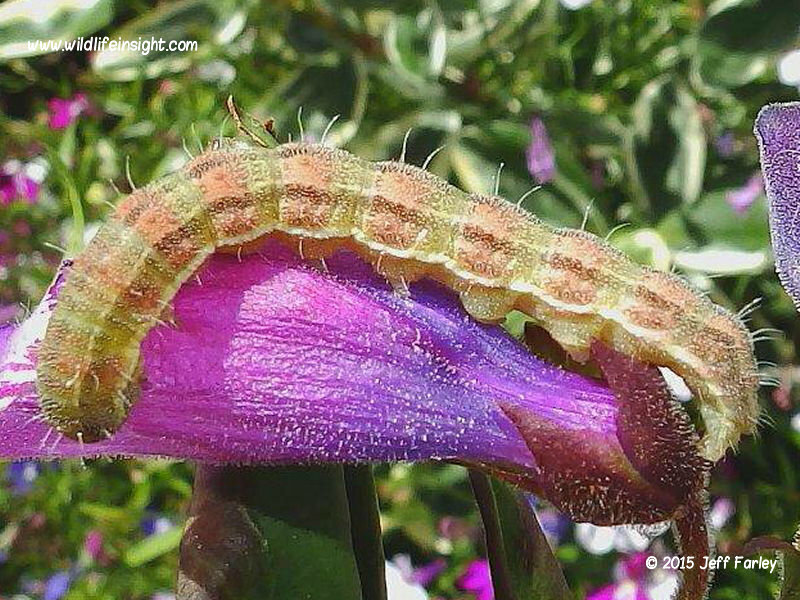 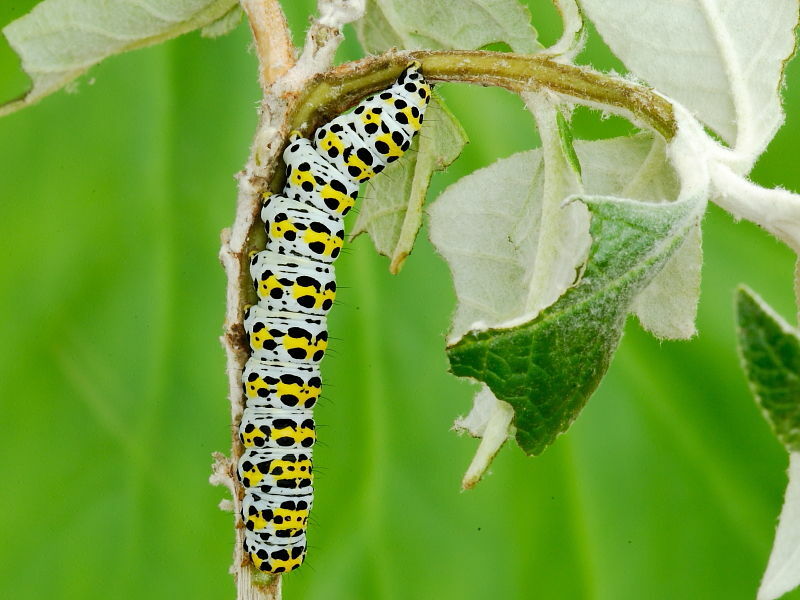 The Mullein Moth is one of the most commonly sighted caterpillars in gardens throughout much of the southern half of the UK. 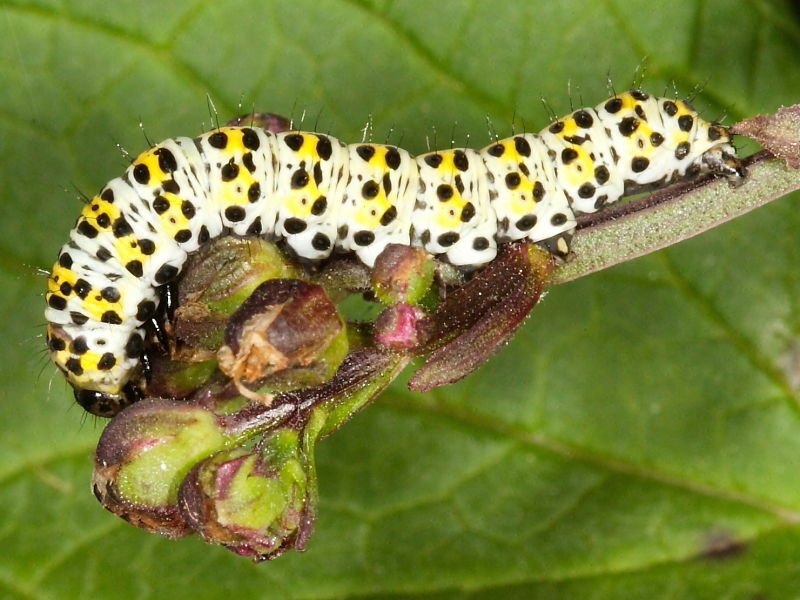 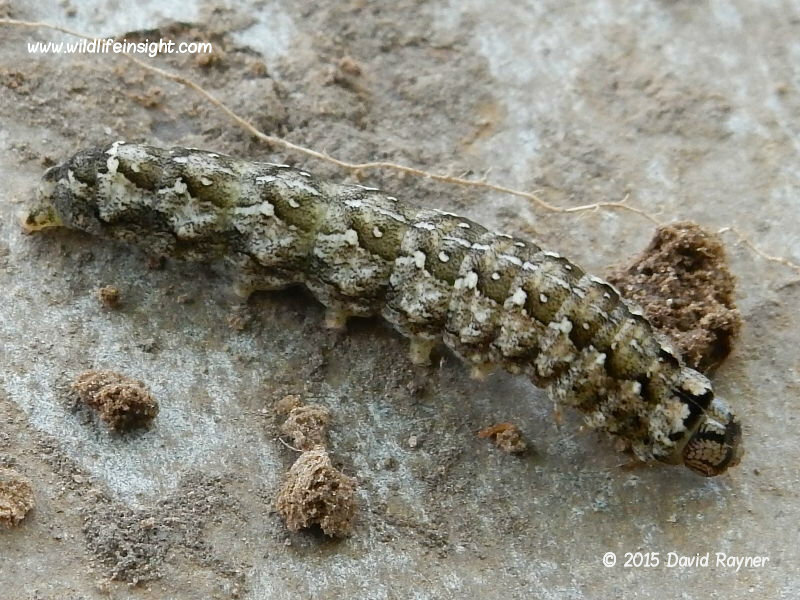 The more local Toadflax Brocade caterpillar is restricted to the south east but spreading. 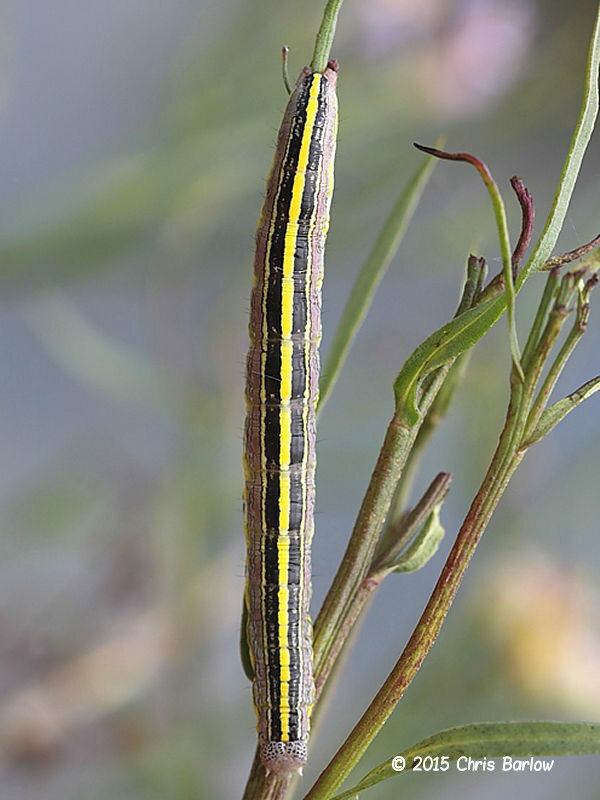 The fabulously marked and variable caterpillar of the Chamomile Shark is more locally distributed and seen less often in gardens. 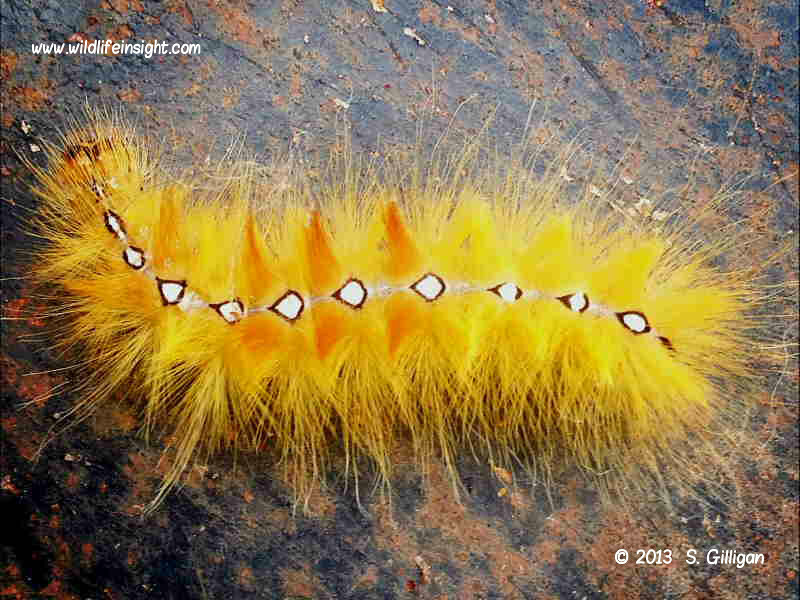 In the Acronictinae family are some moths with extraordinarily hairy and colourful caterpillars. 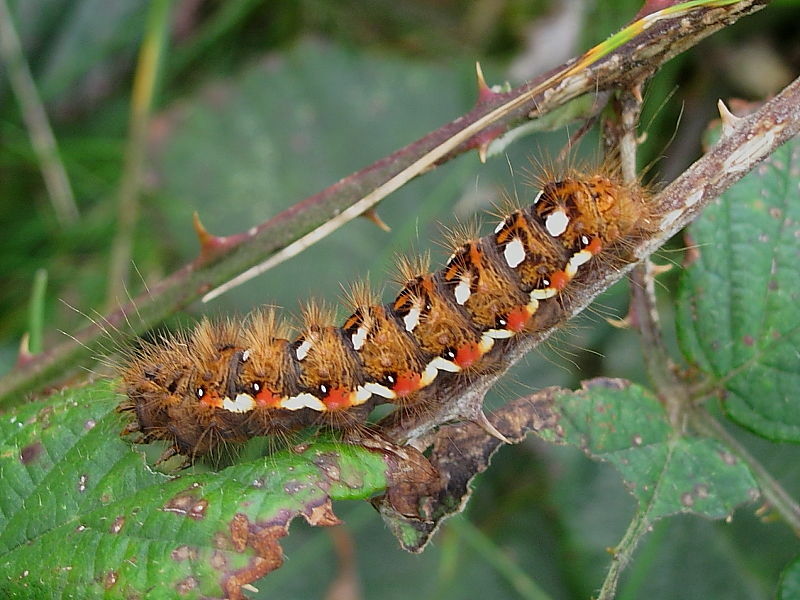 The Knot Grass caterpillar if one of the most commonly sighted caterpillars throughout much of the British Isles. 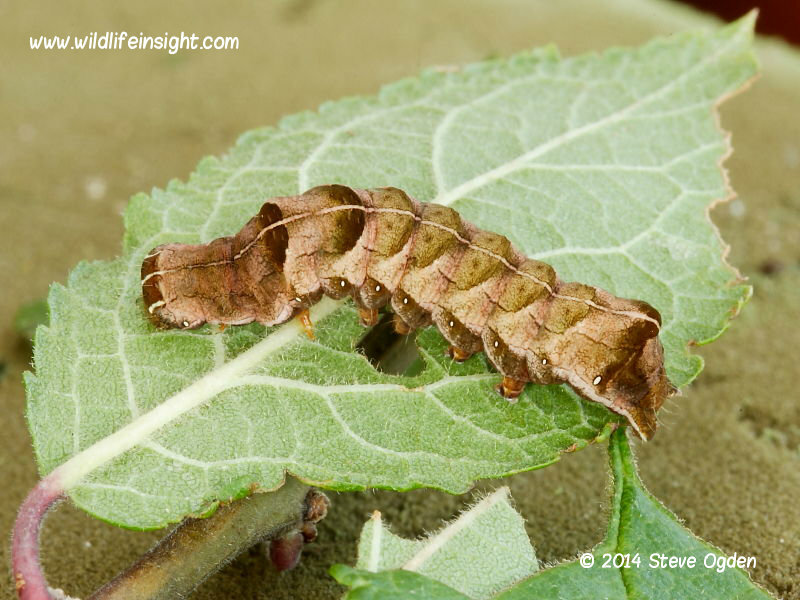 The extraordinarily hairy Sycamore Moth and Miller Moth caterpillars are often sighted when they leave the foodplant to wander in search of somewhere to pupate. 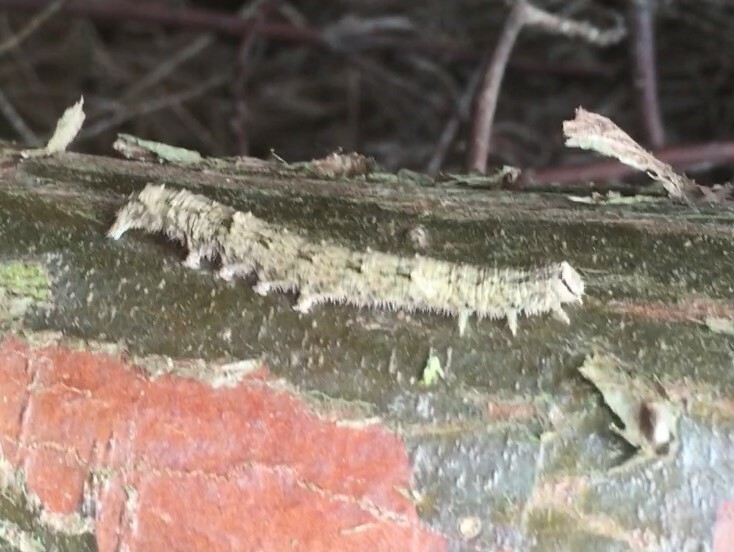 The spectacular Alder moth and The Poplar Grey are widespread but less commonly seen. 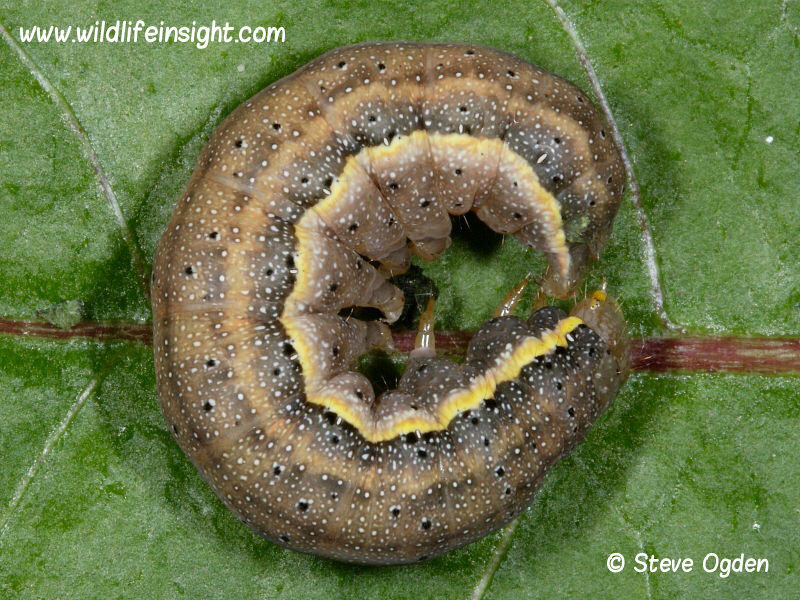 The caterpillars of the Grey Dagger and Dark Dagger both have distinctive dorsal ‘humps’ and are often recorded in woodland and gardens. 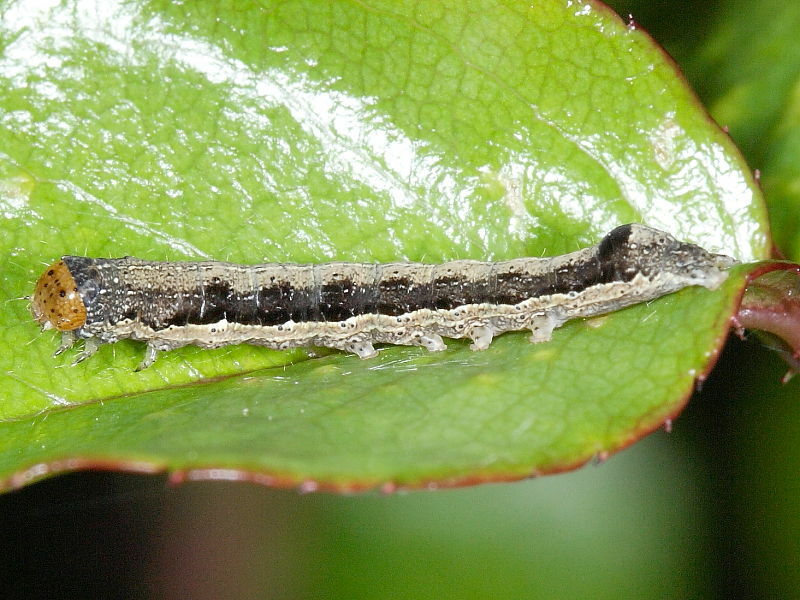 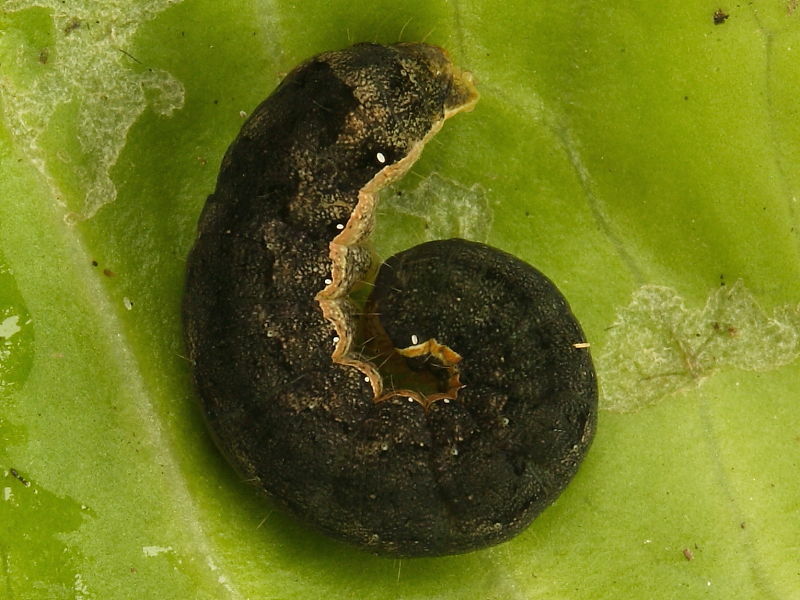 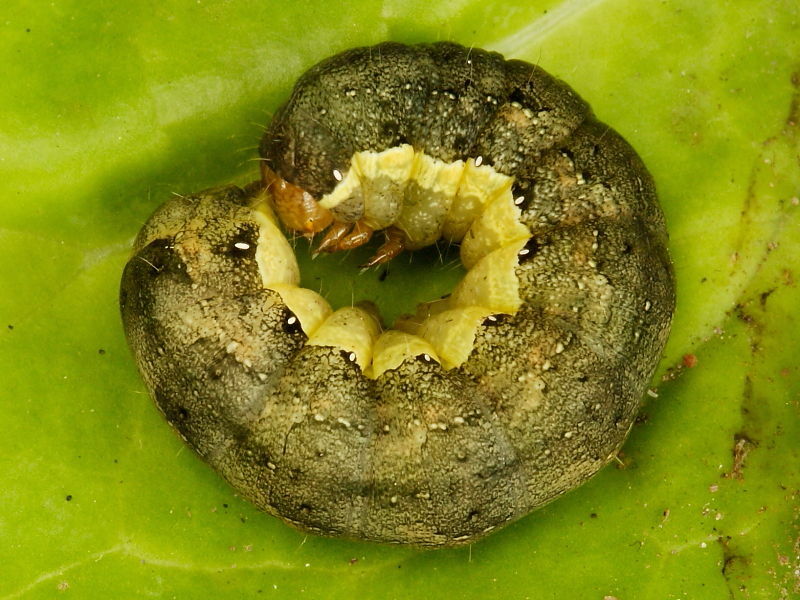 Unusually for noctuid caterpillars there are a few species in the Plusiinae sub family that have fewer prolegs than the normal four and rear clasper. 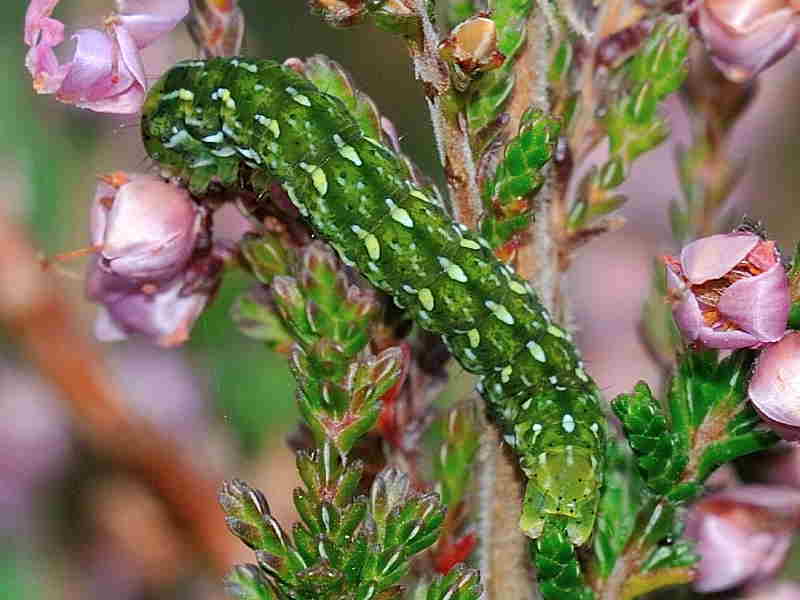 This group in the British Isles includes both resident and migrant species. 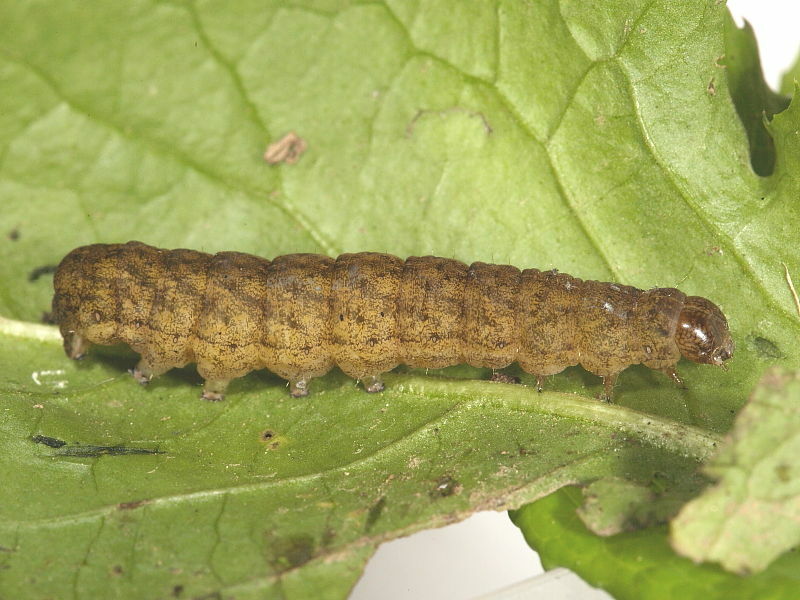 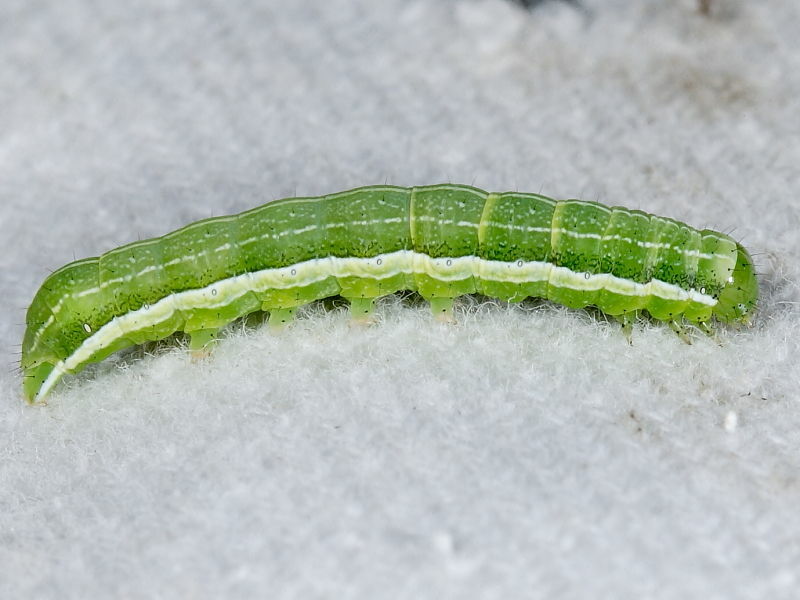 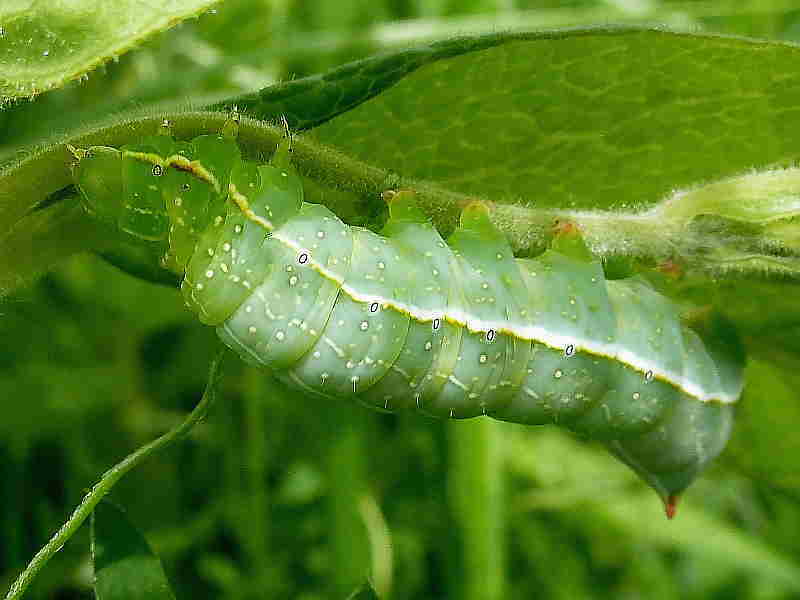 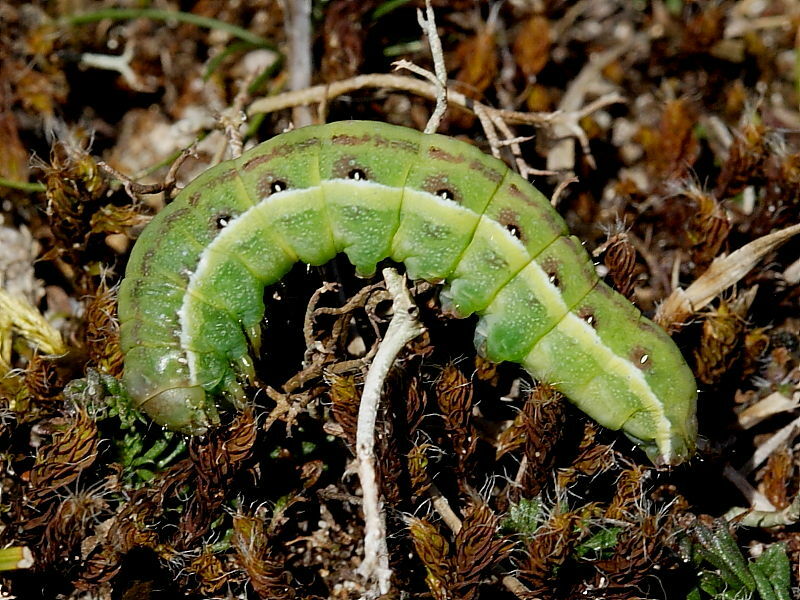 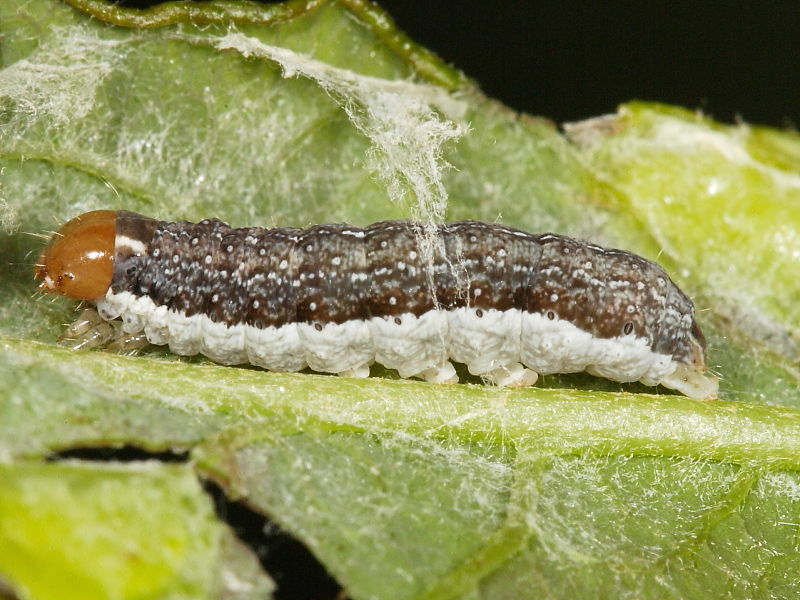 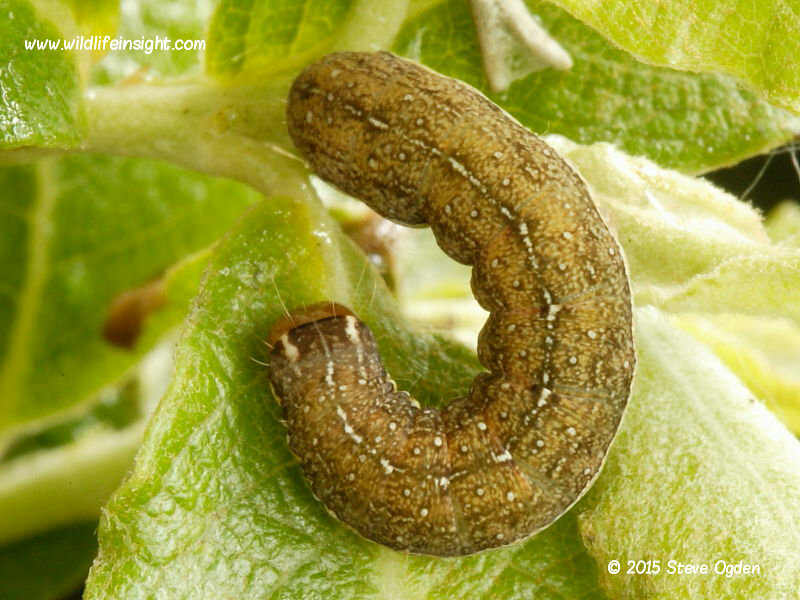 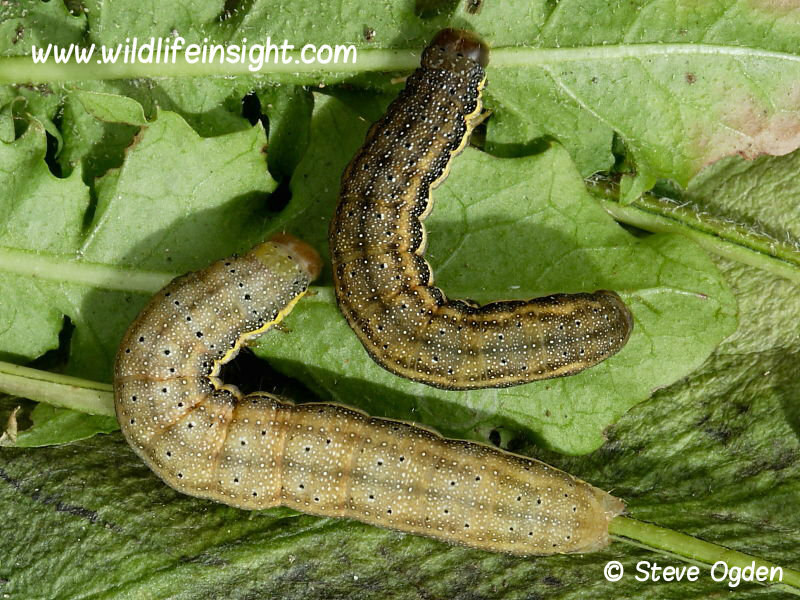 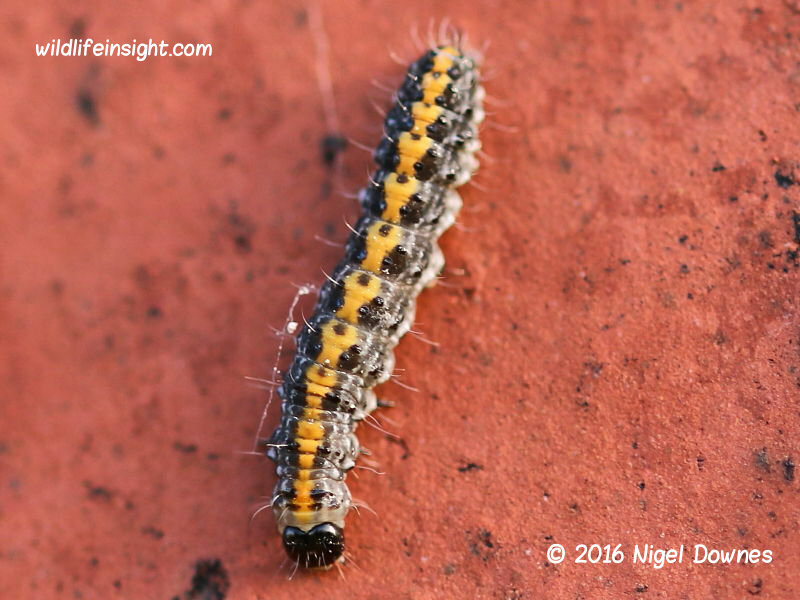 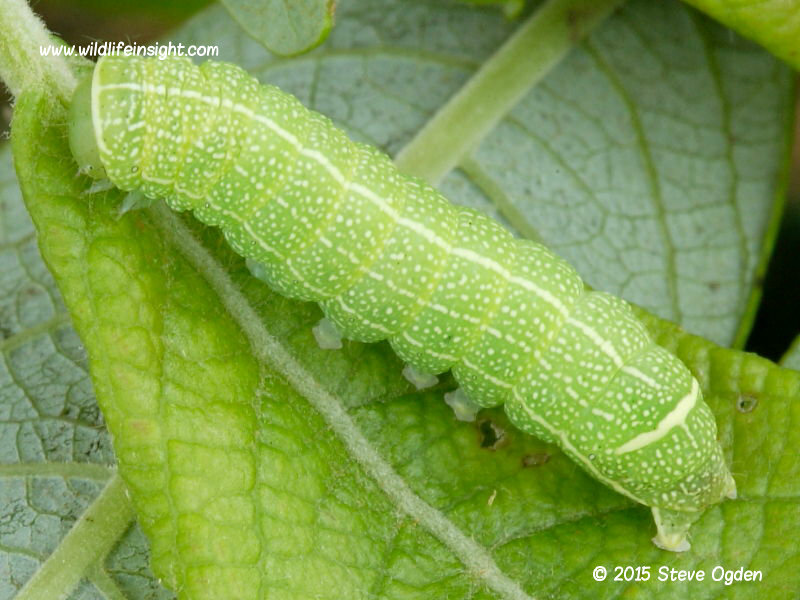 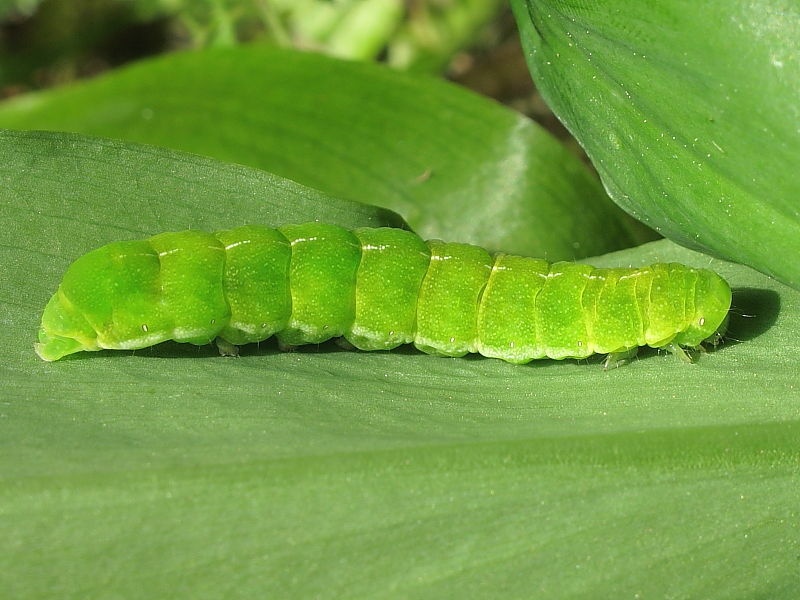 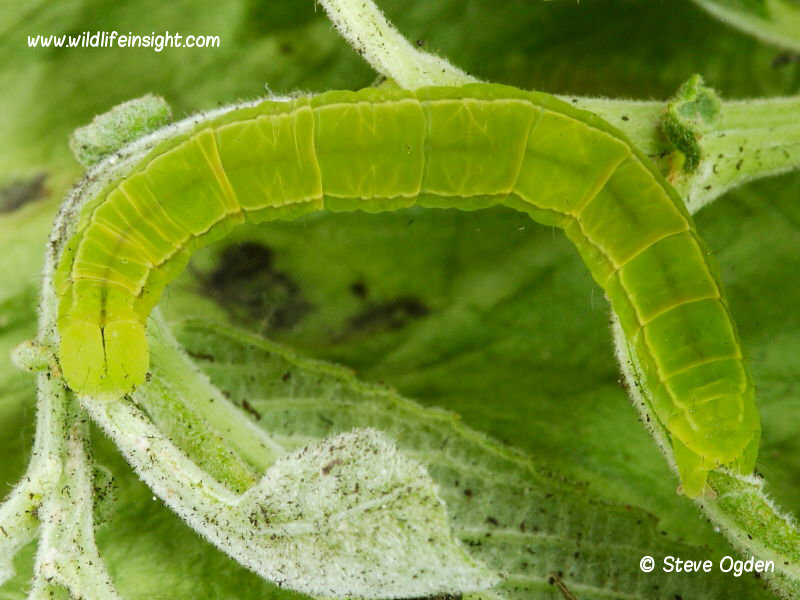 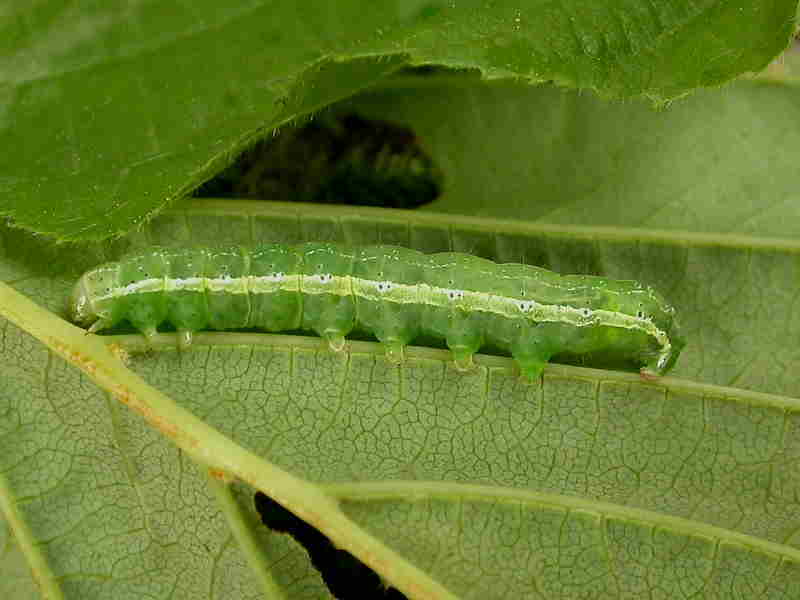 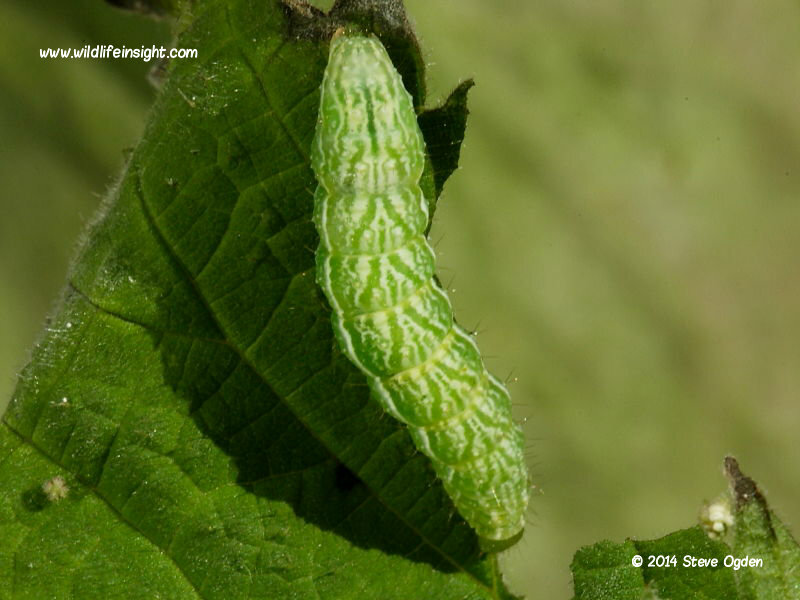 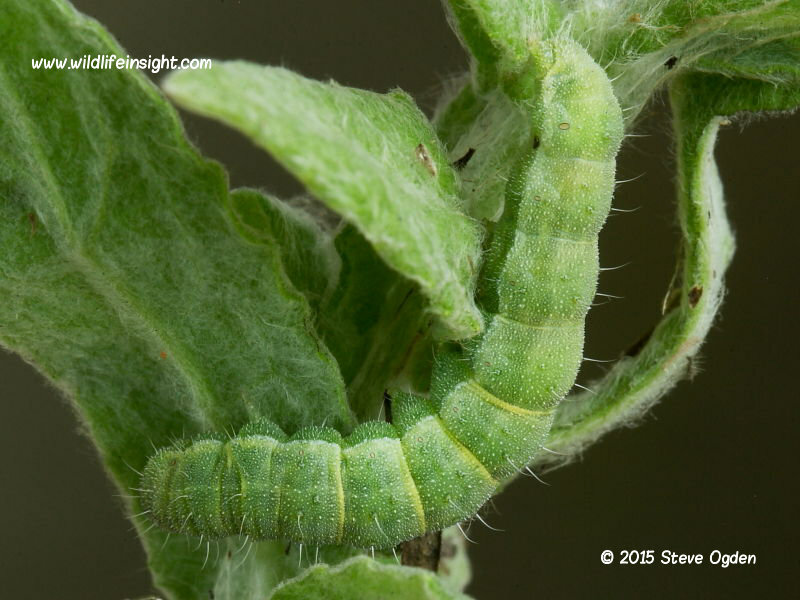 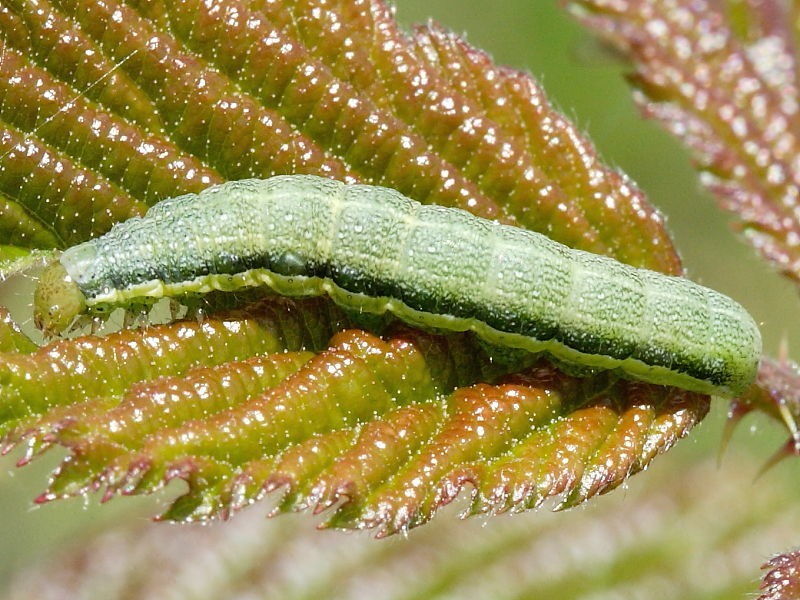 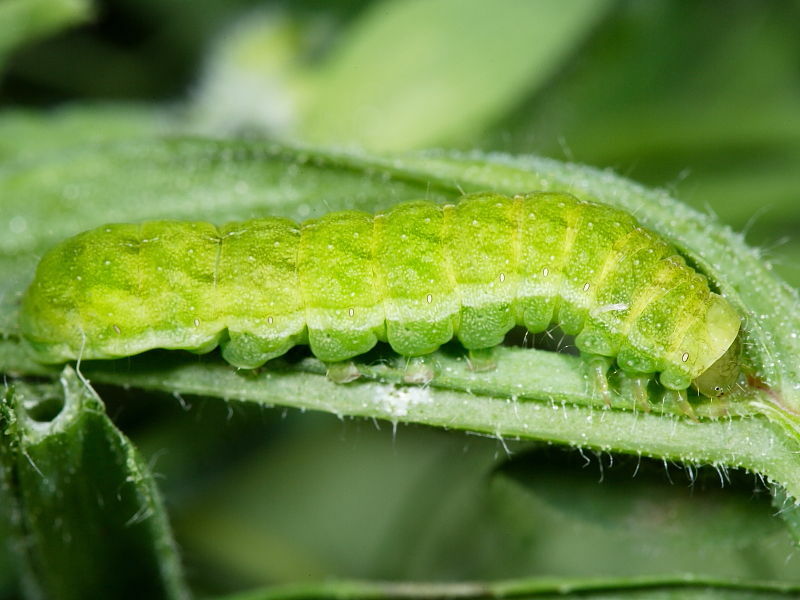 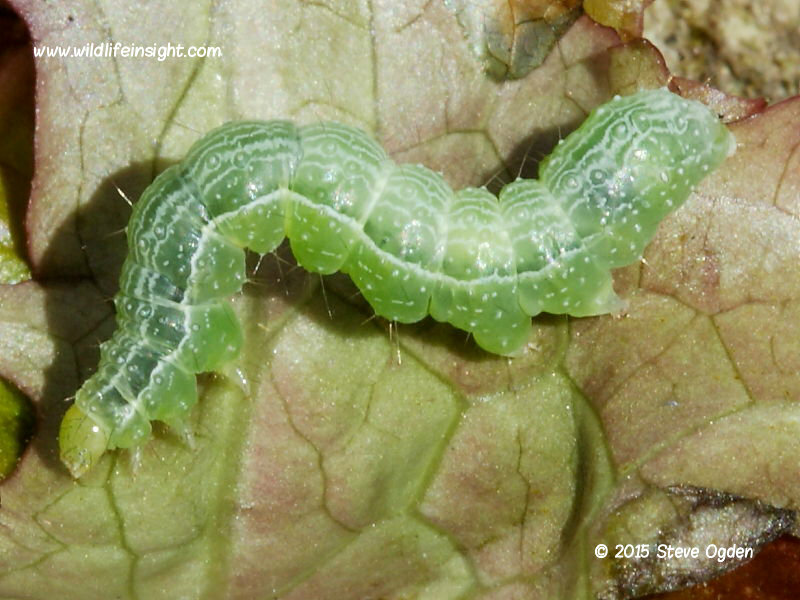 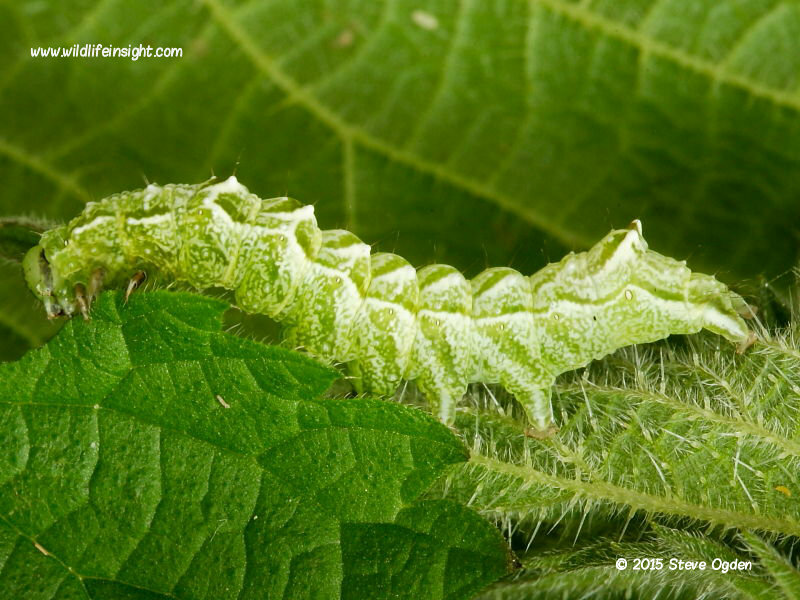 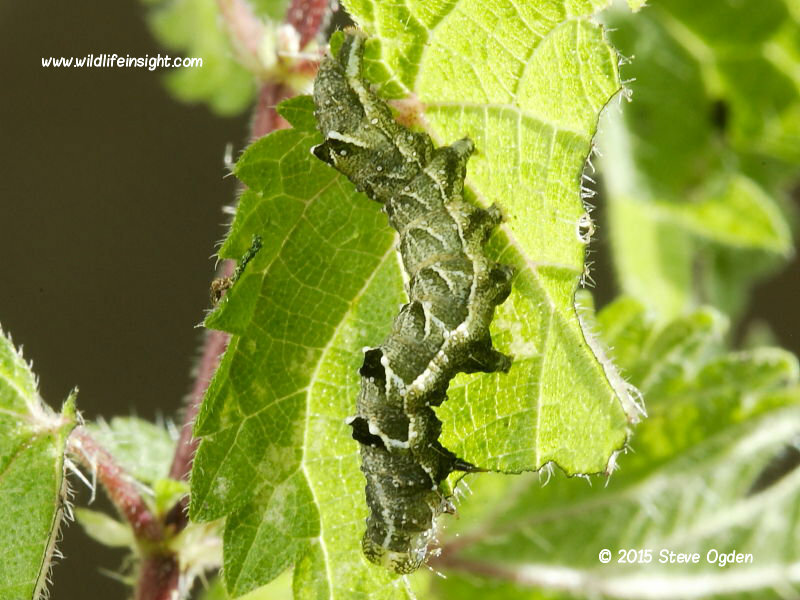 The caterpillars of the Silver Y, the commonest of the larger migrant moths to the UK, are often referred to as the Cabbage looper in other parts of the world where they are considered a pest. 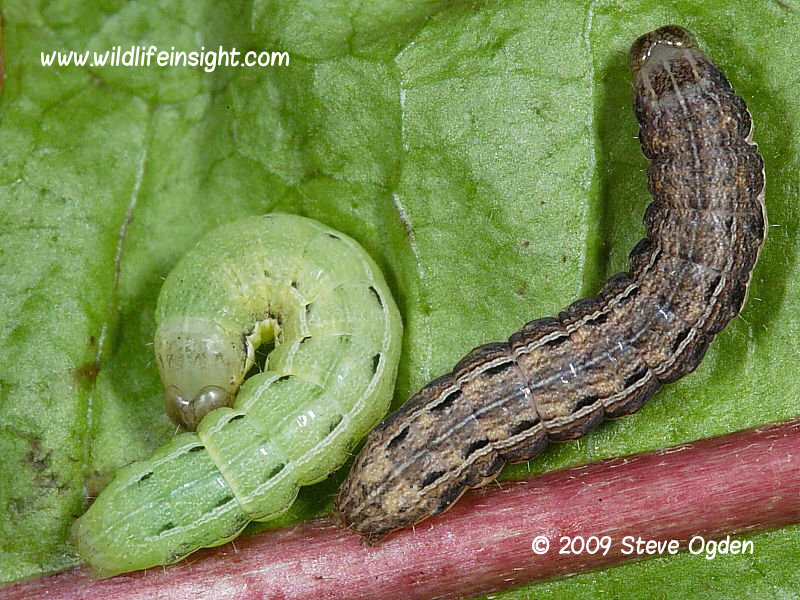 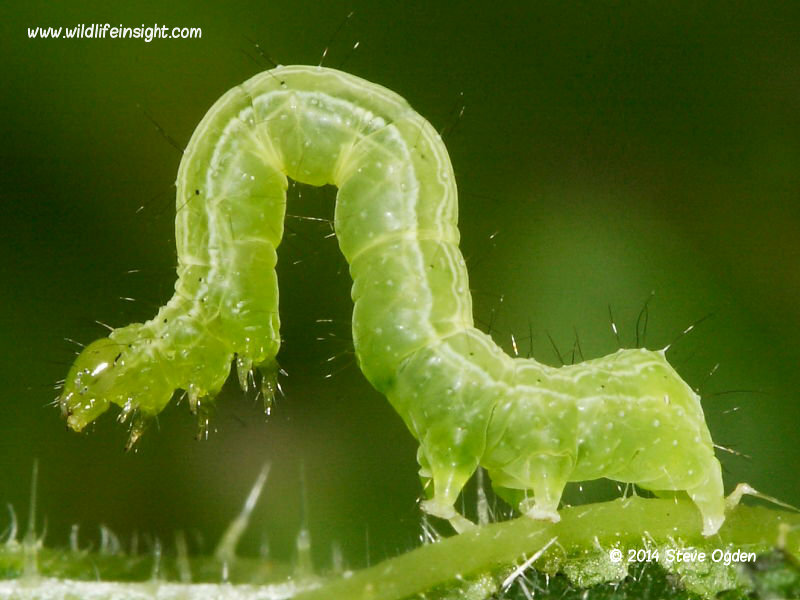 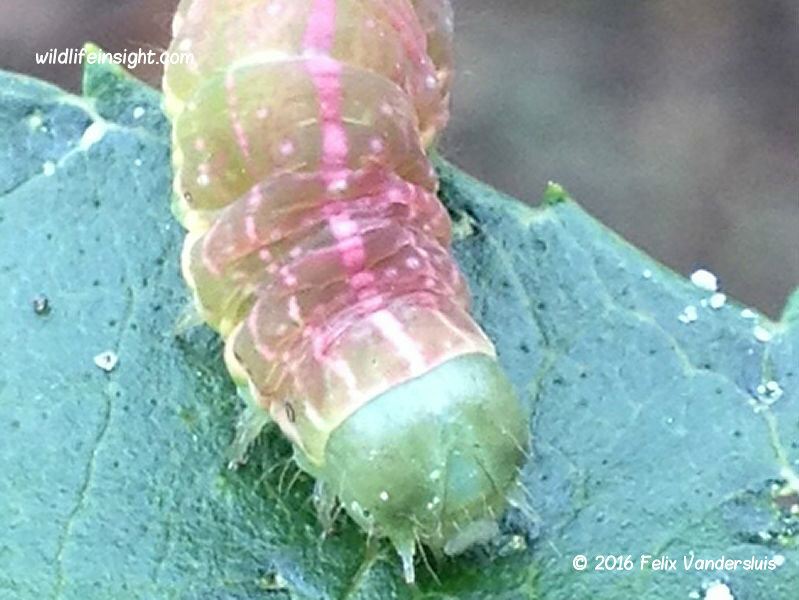 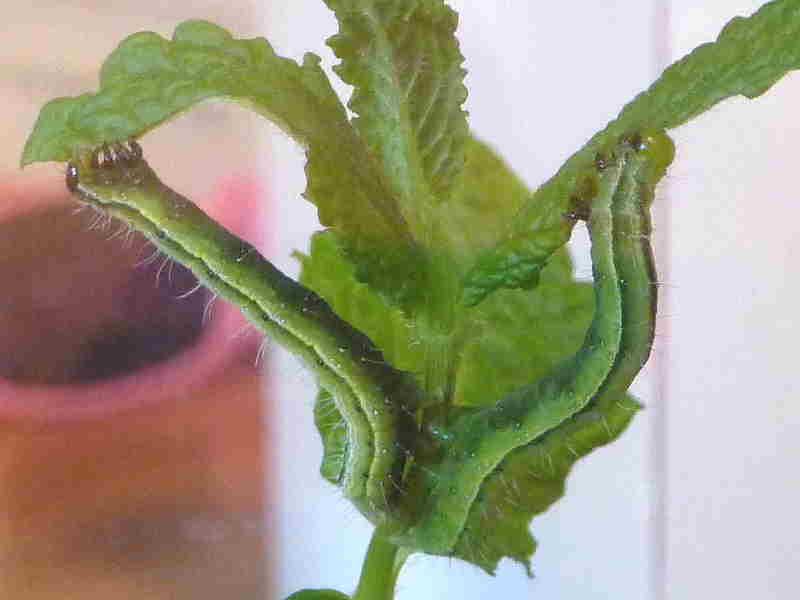 In common with other closely related caterpillars they have two prolegs missing. 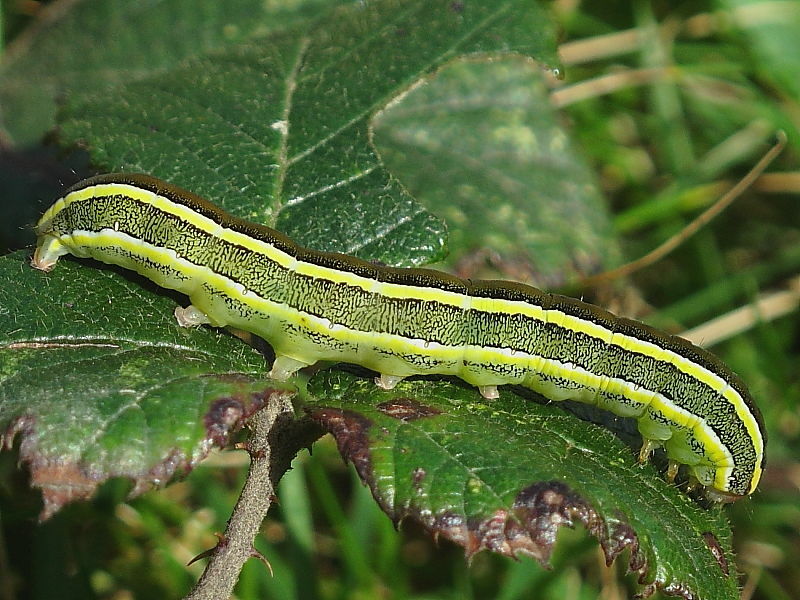 The caterpillars of other rarer migrant species such as Slender Burnished Brass and Double Gold Spot may also occasionally be imported on agricultural produce, although these fail to survive the cold winters.